Guests at the Best Western Lake Buena Vista, like those at the other six hotels in the Disney Springs Resort Area, became eligible for FastPass+ at 60 days and Extra Magic Hours—the two most valued Disney World perks—in 2018, eligibility that will extend at least until 12/31/2019. 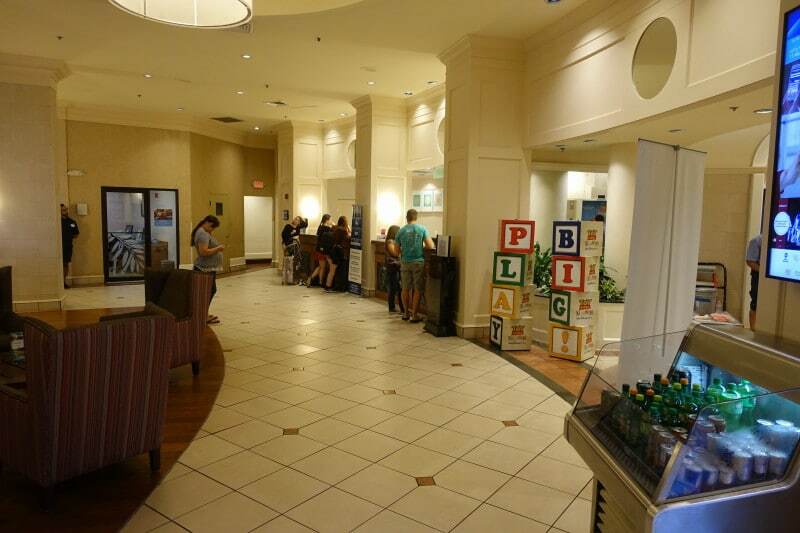 The extension of these perks to these hotels, owned by third parties but located on the far southeast corner of Disney property, made them much more interesting options for Disney World visitors. 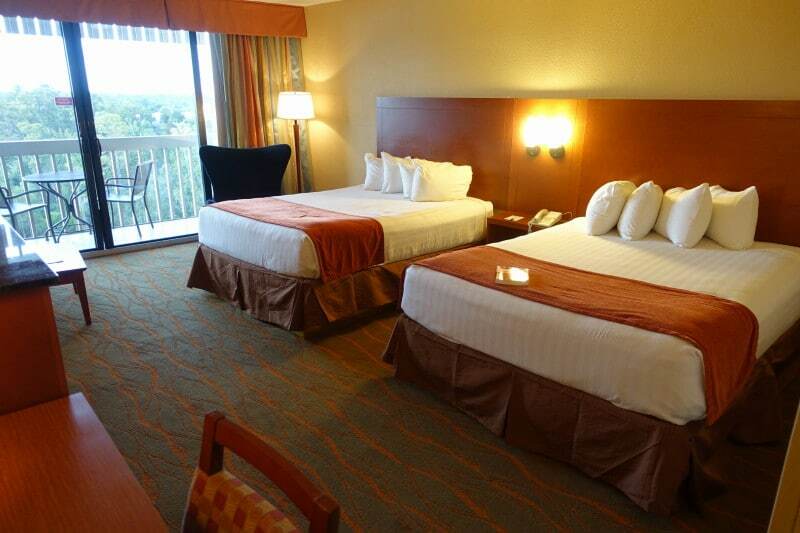 The Best Western Lake Buena Vista offer rooms in its curving tower with a king bed, two queens, or two queens and a sleeper sofa. 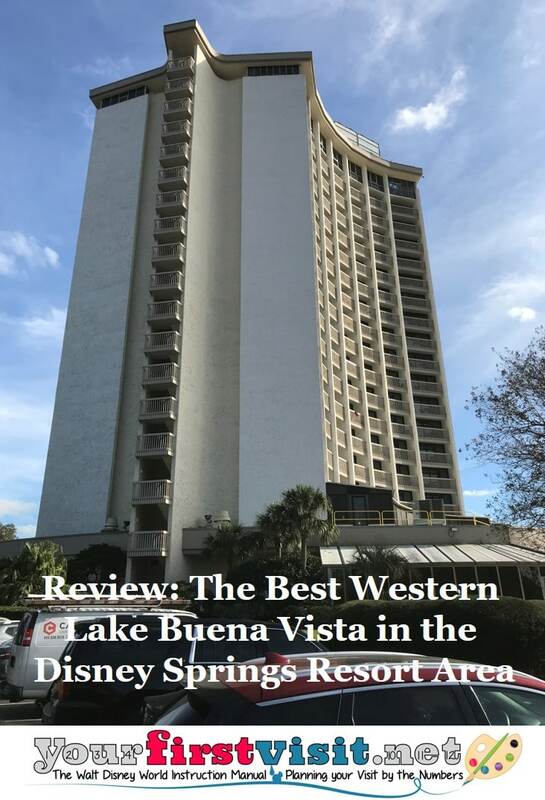 The best features of the Best Western are its spacious rooms with balconies–balconies are rare among the Disney Springs Resort Area hotels–and its low prices, commonly the lowest among these seven hotels. 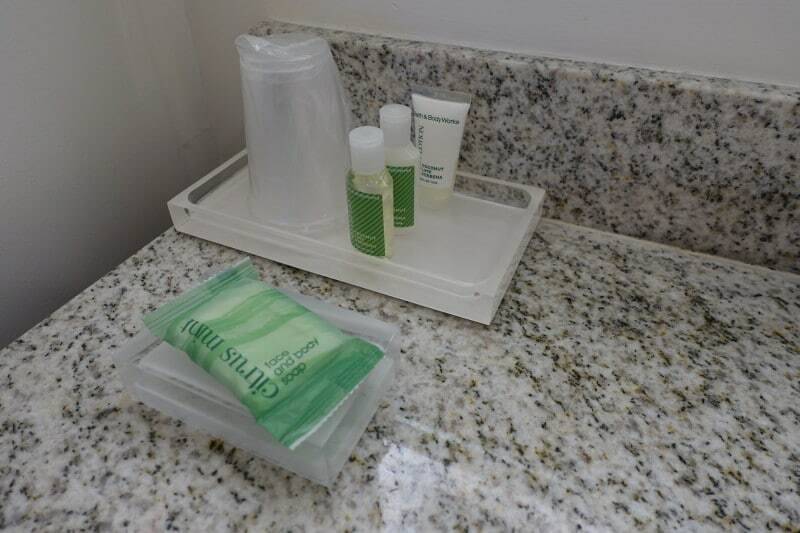 Weaknesses include un-divided baths, and so-so hotel amenities–all the basic amenities are here, but none is special, with the pool particularly weak. 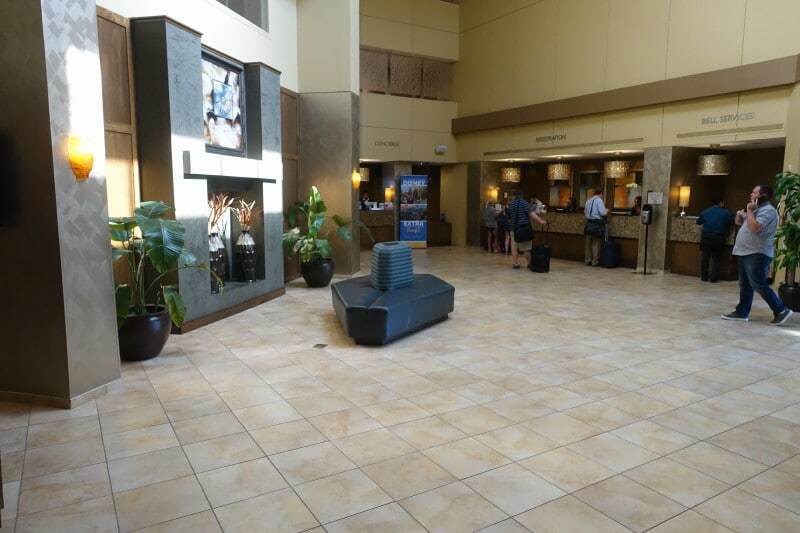 The Best Western Lake Buena Vista shares with the Doubletree Suites the greatest distance from Disney Springs itself, and with all the Disney Springs Resort Area hotels weak transportation. 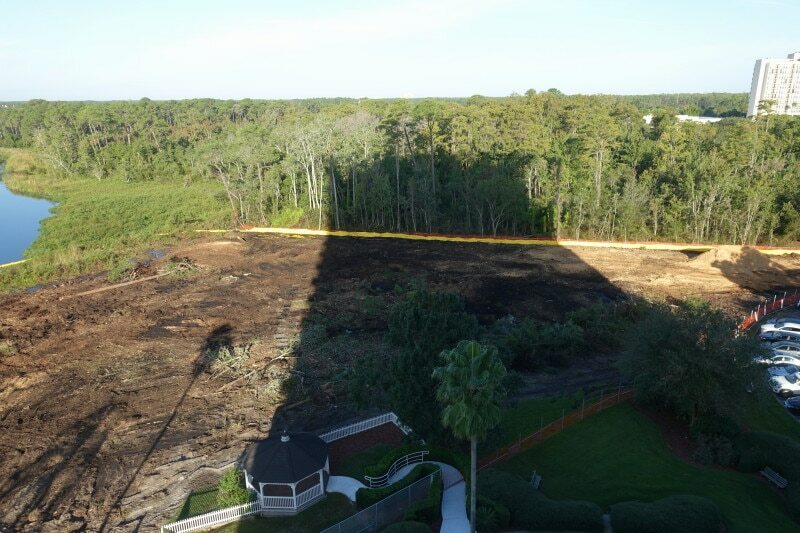 Moreover, the Best Western Lake Buena Vista was recently bought by Drury, and is undergoing a building program including an added bed tower that currently adds visual blight and will soon add daytime construction noise. 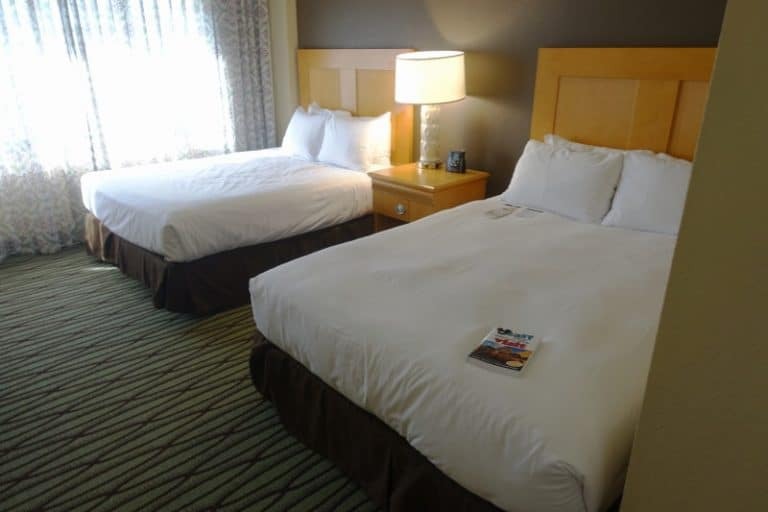 Standard rooms at the Best Western offer one king bed, two queen beds, or, in “deluxe queen” rooms, two queen beds and a sleeper sofa. 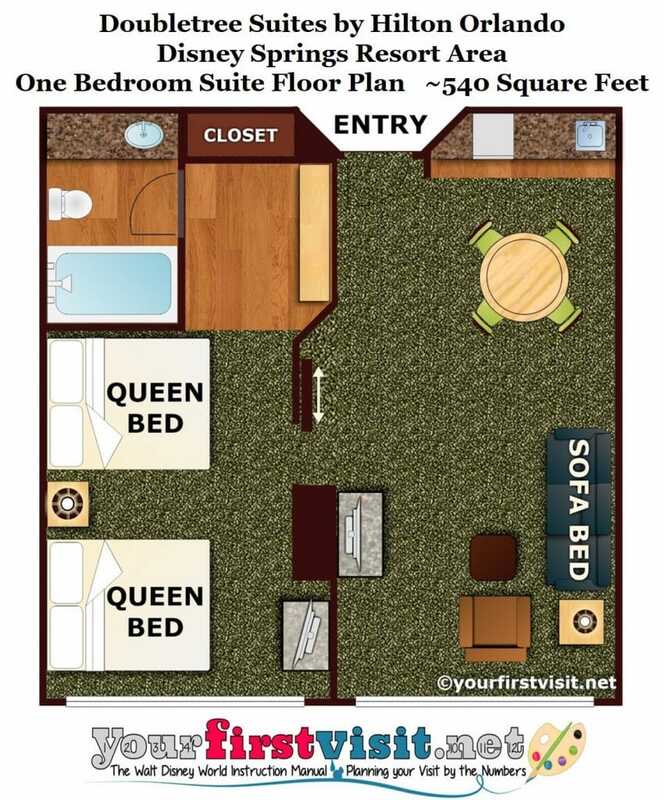 The floor plan is of a deluxe queen room–standard rooms lose the couch, and the bump-out that allows it to fit. 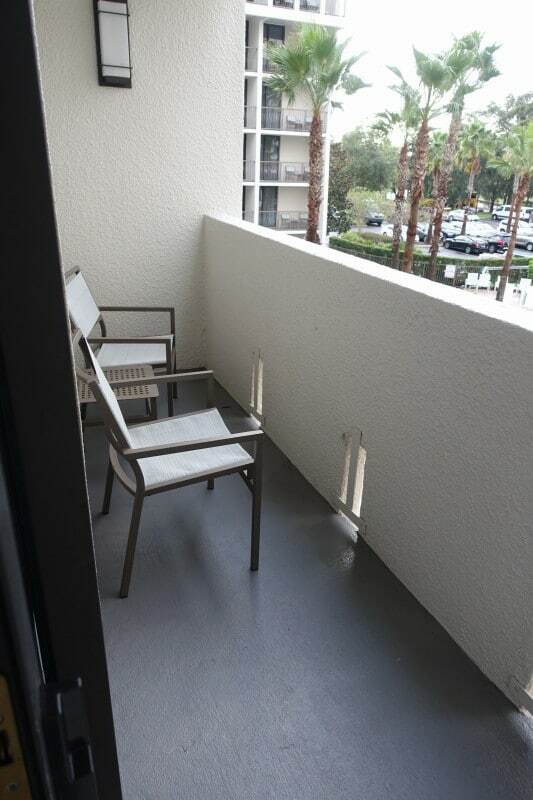 Note the balcony–among the Disney Springs Resort Area hotels, only the Best Western, the Holiday Inn and Hilton Buena Vista Palace offer balconies in the vast majority of their rooms. The undivided bath opens from the main entry hall. 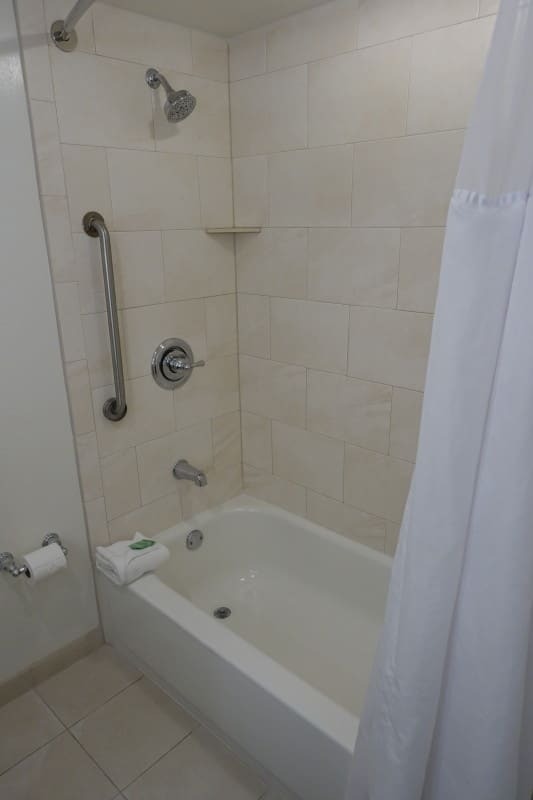 A divided bath would make this space much more livable–especially for families filling a deluxe queen room. There’s space here for a second sink, on the counter that is currently largely wasted with the coffee service. Here’s hoping that such a sink is added as part of Drury’s renovation work here. 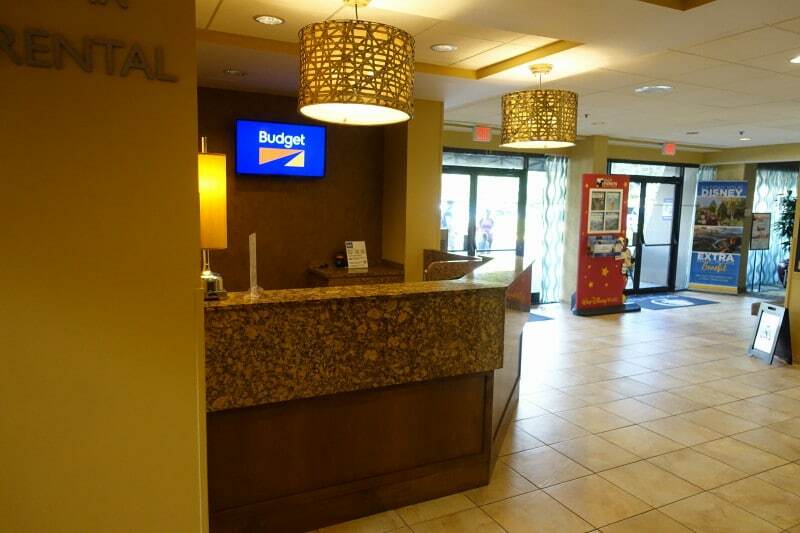 More on accommodations at the Best Western is here. 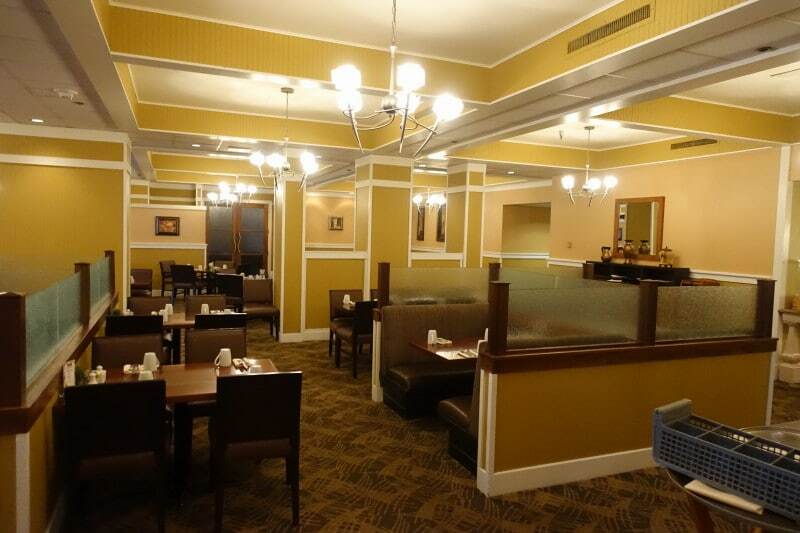 The principal dining venue at the Best Western Lake Buena Vista is the Trader’s Grill, serving a breakfast buffet, and also dinner, and which also has an attached bar. 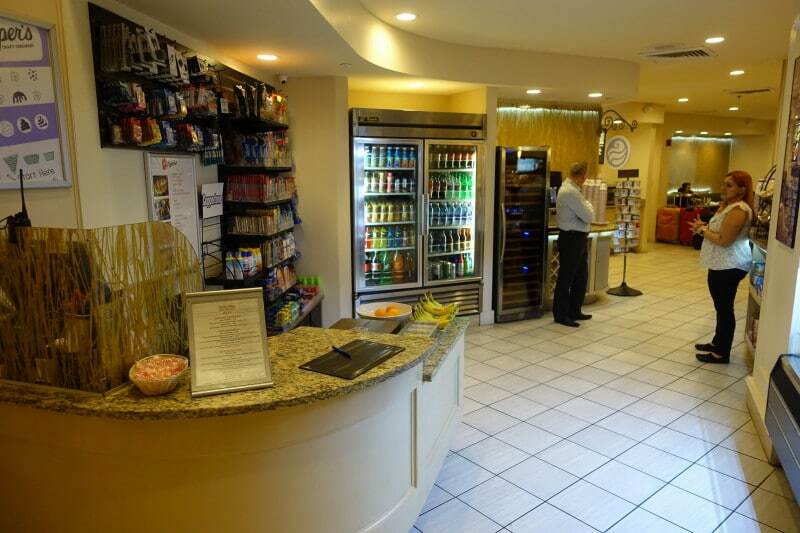 For lunch or all-day needs, snacks, drinks, pizza, wings, and grab and go items are available in a shop near the lobby. 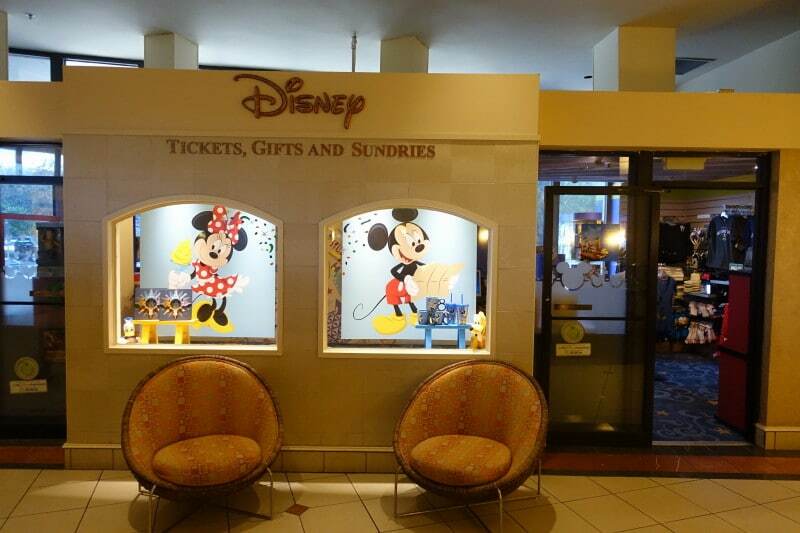 There’s also a tiny but well-stocked Disney gift shop offering souvenirs, park tickets and such off the lobby. 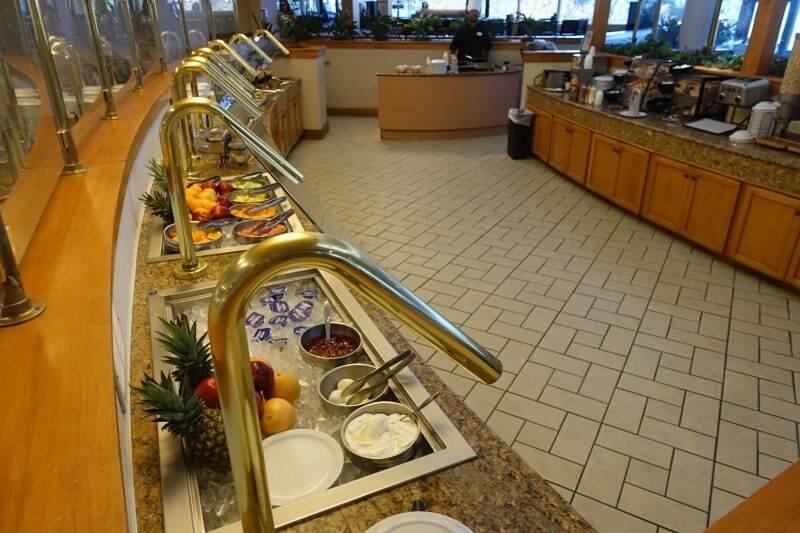 There’s more on dining and the other amenities at the Best Western here. The pool at the Best Western Lake Buena Vistas has the basics–a pool and a hot tub–but nothing else–at least not that I noticed. 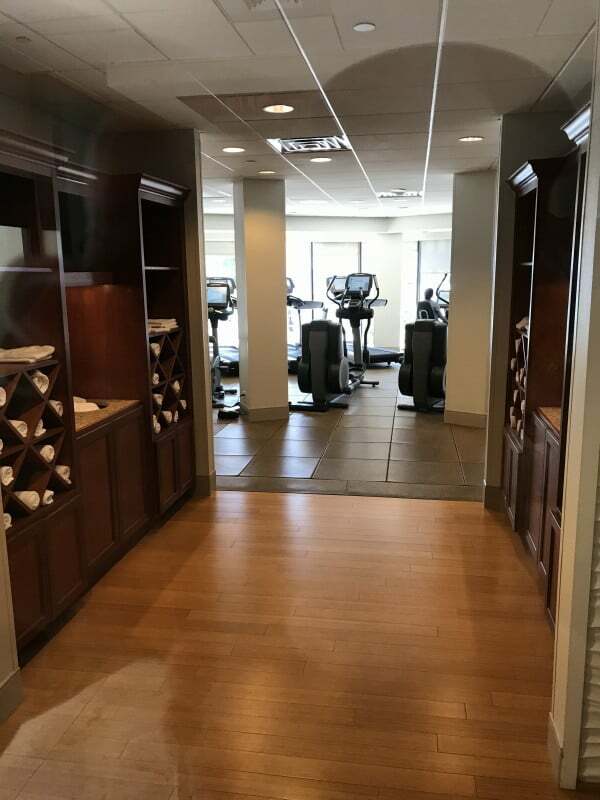 It is adequate, but in the bottom rank of the pools at the Disney Springs Resort Area hotels, and will certainly be too small after the new room tower here opens. A better, more interesting, and more fun pool would be welcome as part of the rebuild of this property. For more on the pool at the Best Western, see the bottom of this. 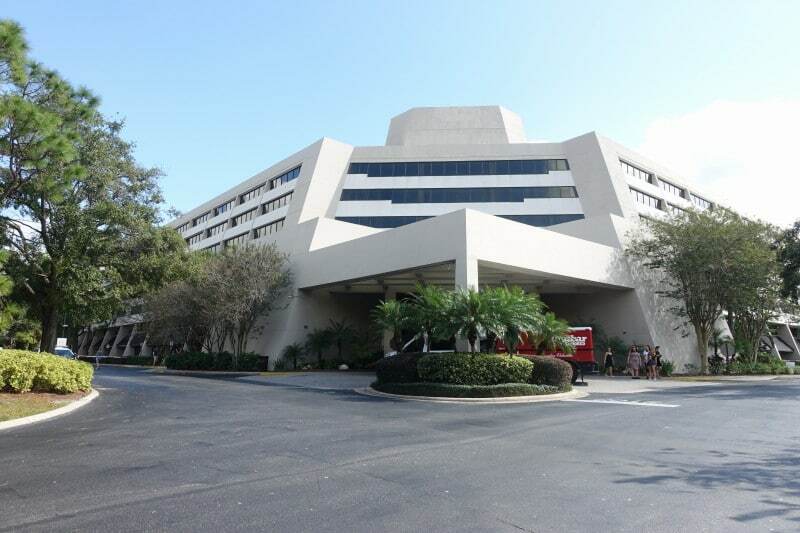 The Best Western Lake Buena Vista participates in a transportation program sponsored by all the Disney Springs Resort Area hotels. One group of buses serves the Best Western, the Wyndham, and the Palace, and another group serves the four hotels on the other side of Hotel Plaza Boulevard. Buses run about every thirty minutes, each serving two parks–so, for example, to get to Disney’s Animal Kingdom, you may have travel to the Magic Kingdom first. Moreover, unlike the buses from Disney-owned resorts, Magic Kingdom buses drop off at the Transportation and Ticket Center, not the park itself, necessitating another transit, via monorail or ferry, to get to that park. In addition to the theme park buses, buses to and from Disney Springs run through the evening. On the important dimensions–frequency, and the time it takes to get to and return from the parks–the transportation system at the Disney Springs Resort Area is much worse than that at the Disney-owned resorts, but better than that at most off-site hotels. Having your own car or a rental is a much better option. 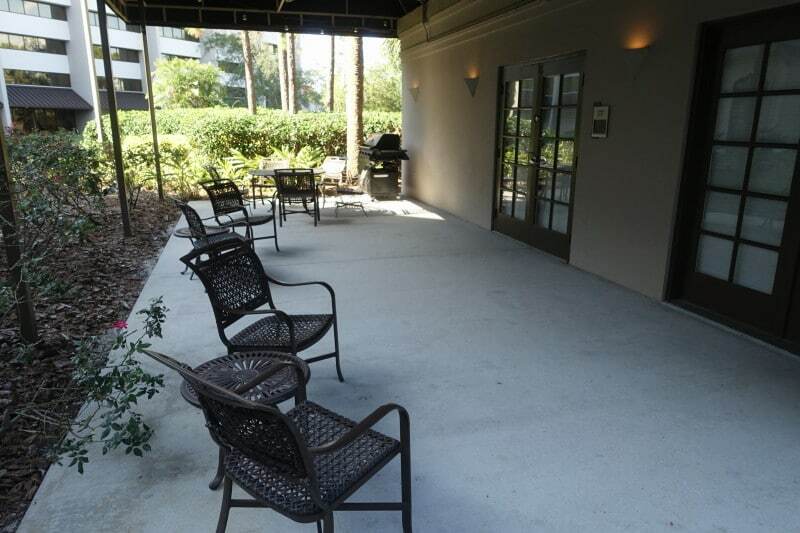 Self-parking at the Best Western Lake Buena Vista is $8/night and valet parking is $12/night. These are, by far, the lowest parking rates among the Disney Springs Resort Area hotels. Parking at the theme parks is $25/day. 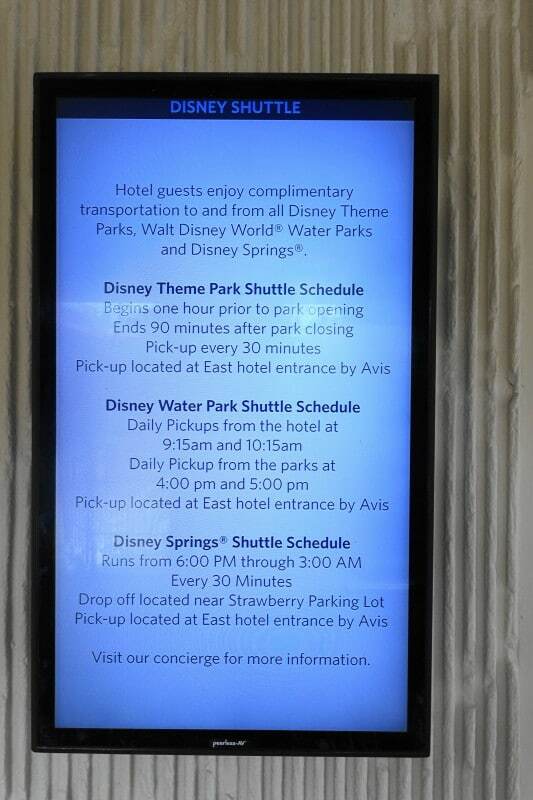 For more on transportation at the Disney Springs Resort Area hotels, see this. 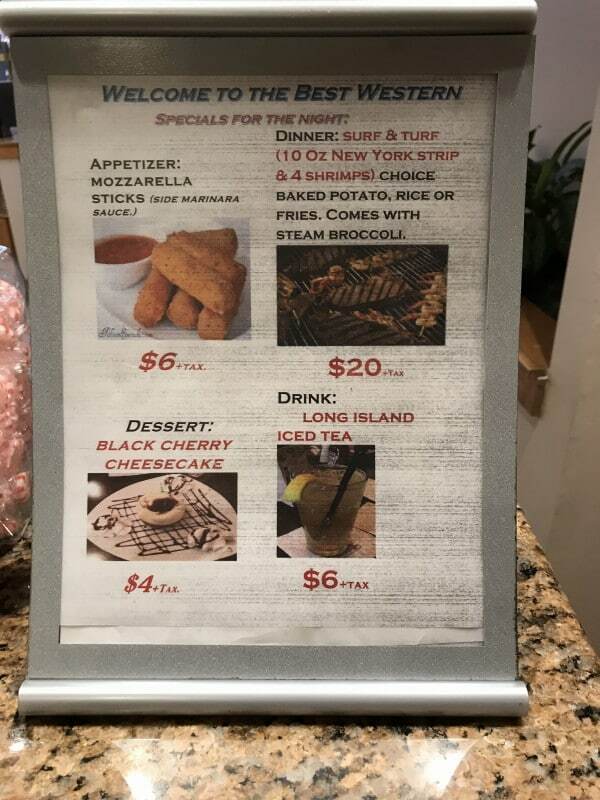 Pricing at the Disney Springs Resort Hotels is much less visible than that at the Disney-owned resorts, and multiple prices for the same room e.g. for non-refundable stays, stays by folk with AAA, etc. are common. 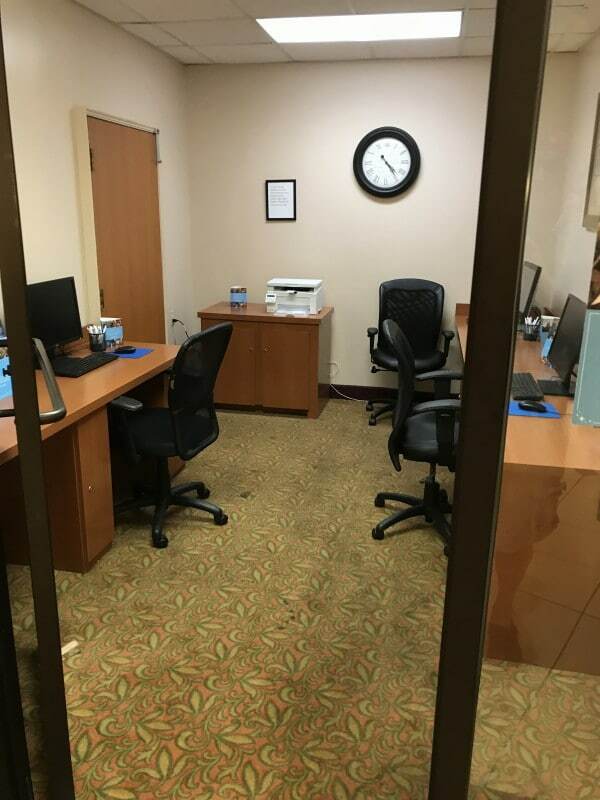 Discounts and deals are also common, especially for the hotels like the Best Western Lake Buena Vista without significant convention business, and these hotels commonly show up on the various hotel deal sites. 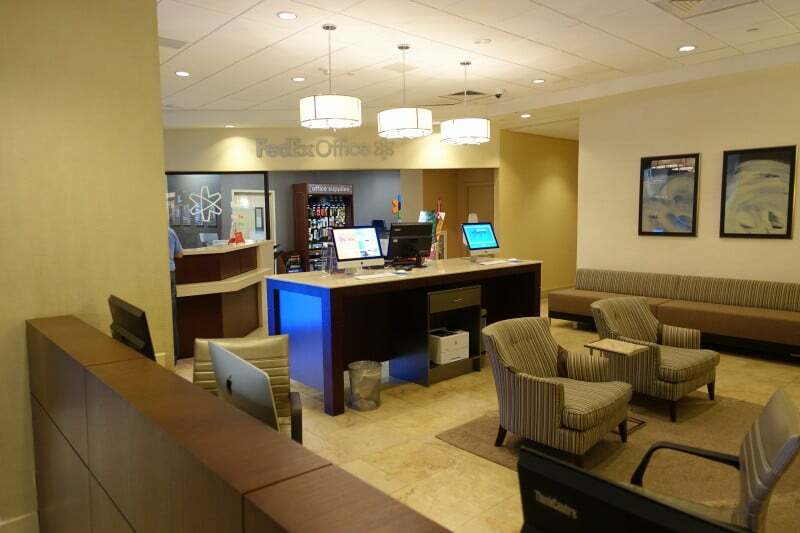 Look for more deals at the Best Western Lake Buena Vista as construction ramps up. Pricing for most of them is also obscured by mandatory “resort fees.” Resort fees are a mandatory extra cost added every night of your stay, whether you like or not. I personally find mandatory resort fees a misleading and unethical practice. A fee that is mandatory, and charged each night, should simply be rolled into the nightly room price. The Best Western Lake Buena Vista resort fee is (after tax) $19.24 per night–second lowest among the Disney Springs Resort Area hotels. 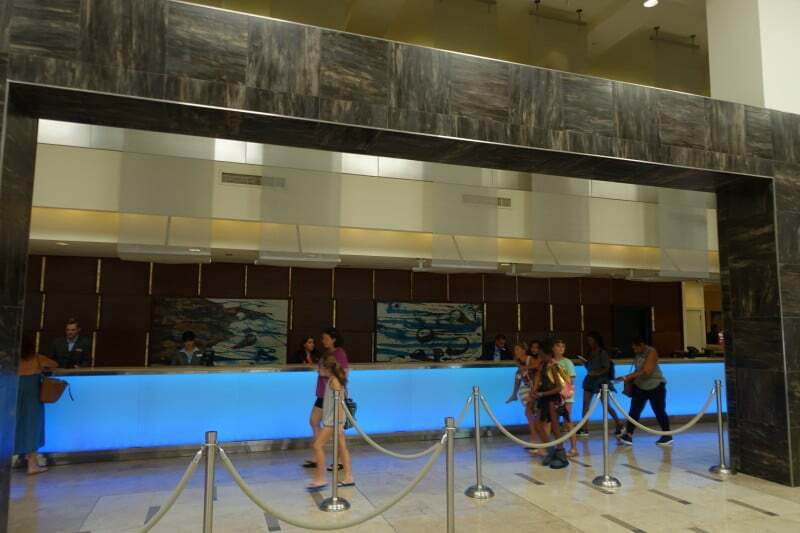 Only the Doubletree Suites–which has the integrity to not charge a resort fee at all–is lower. 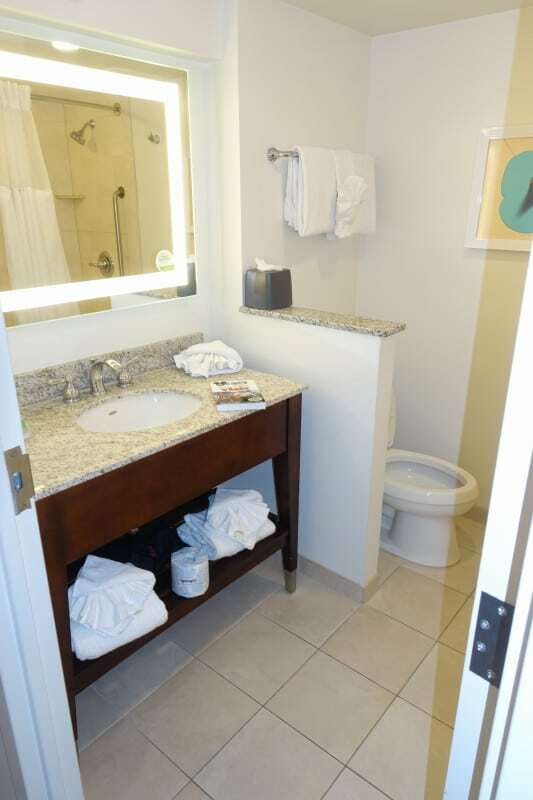 For some families on a tight budget, the opportunity to get queen beds (rare at the Disney values except at Pop Century and refurbed rooms at All-Star Movies), a balcony, and a spacious room may trump the absence of a divided bath, so-so amenities (especially the pool), and weak transportation. Frankly though, I would avoid the Best Western Lake Buena Vista until it gets through its construction period. 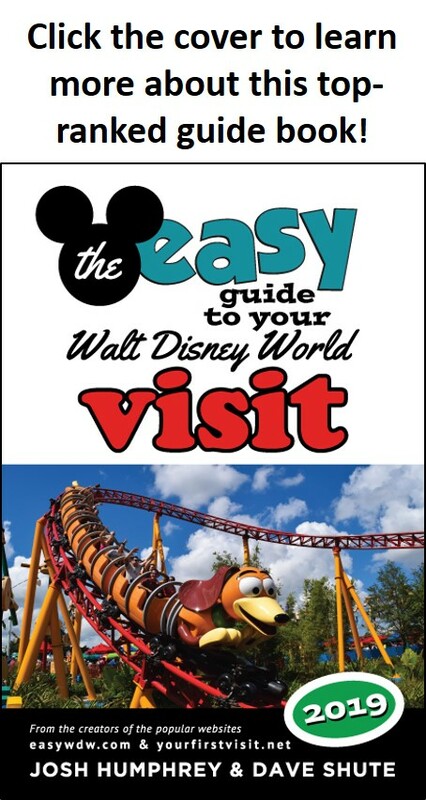 Kelly, the long-time travel agent partner of this site, can book your Disney World vacation at the Best Western–or at any other Disney World hotel. Contact here using the form below. 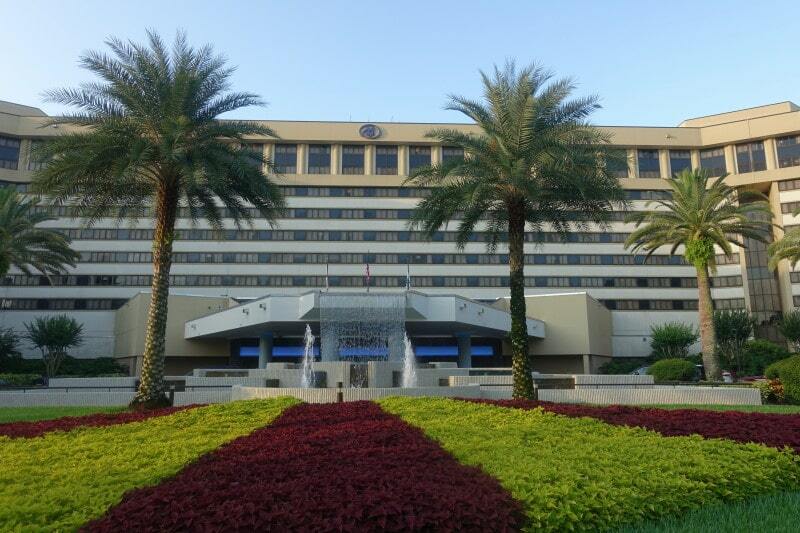 Guests at the Doubletree Suites by Hilton Orlando, like those at the other six hotels in the Disney Springs Resort Area, became eligible for FastPass+ at 60 days and Extra Magic Hours—the two most valued Disney World perks—in 2018, eligibility that will extend at least until 12/31/2019. The Doubletree Suites by Hilton Orlando is distinguished by being the only all-suite hotel among the Disney Springs Resort Area offerings. 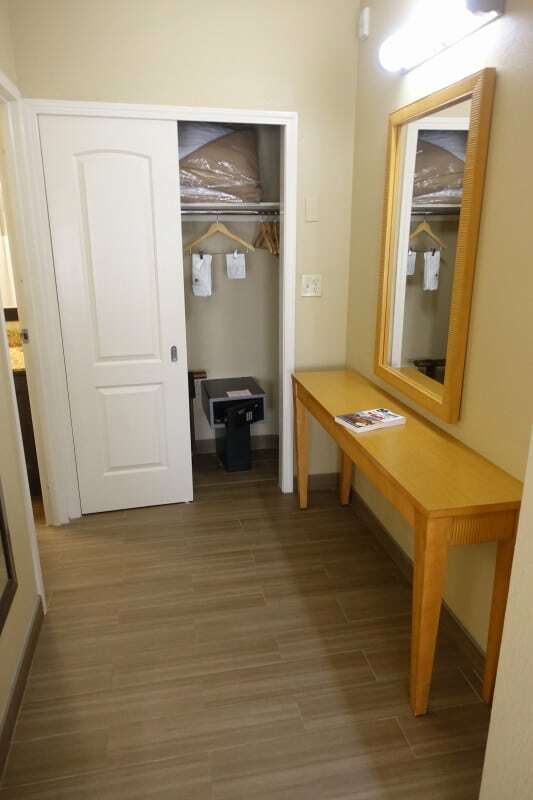 Its (largely) two-bay suites have two queen beds (or one king bed) and an undivided bath in a back room, and a living-dining-mini-kitchen area (with a microwave and mini-fridge) in the front bay, including a couch that will fold out to sleep two more. That said, design and furnishing choices make the space awkward for more than three or four, it is tied for being the furthest of the Disney Springs hotels from Disney Springs itself (although that matters little if your focus is on the theme parks, not on Disney Springs, which is a dining and shopping area), its amenities are adequate but undistinguished, and like all the Disney Springs Resort area hotels, it suffers from a transportation system that is weaker than what you will find at Disney’s own resorts. 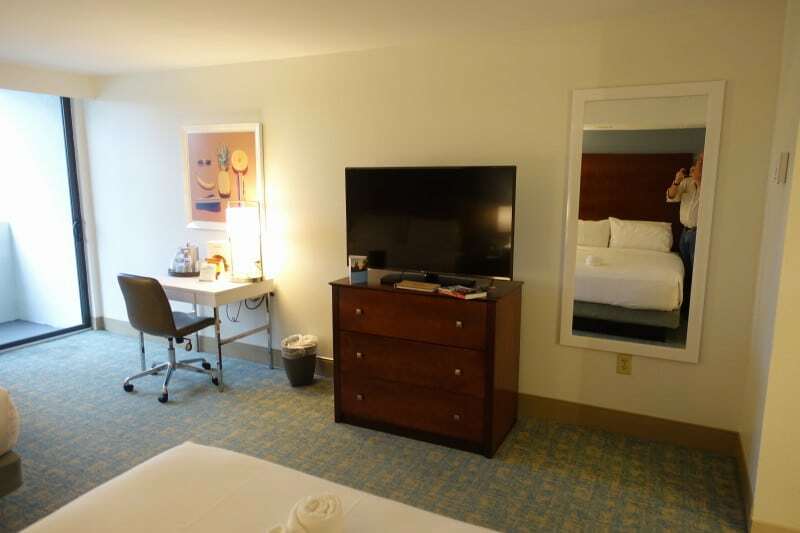 Positives at the Doubletree Suites by Hilton Orlando include its pricing—typically in the lower range of the seven hotels here, and competitive with the weaker single-room offerings here like those at the Best Western and the Garden rooms at the Wyndham (not the Tower rooms there), and its sports and tennis courts, unmatched among the Disney Springs Resort Area hotels except, perhaps, at the Wyndham. The living-dining-kitchen area includes a microwave and mini fridge, a table that seats four, and an easy chair and couch that also folds out into a bed that sleeps two. This spacious area could be furnished to seat six in both areas, but is not. …and an undivided bath entered by an open hall from the queen bedroom area with much wasted space. A better design would be to add a second sink in the current closet area, close off this space from the bedroom area with a door, and add a door from the new divided bath to the kitchen-living-dining area, converting what is left of the area currently covered by the six foot long table (!) to a new, smaller closet. A divided bath which could be entered from either sleeping area without disturbing the other would make this space much more livable for larger families. 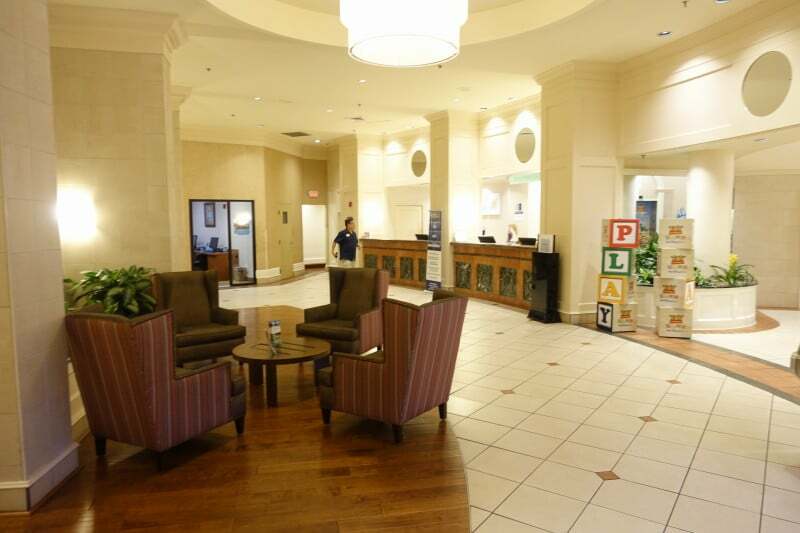 More on accommodations at the Doubletree Suites is here. 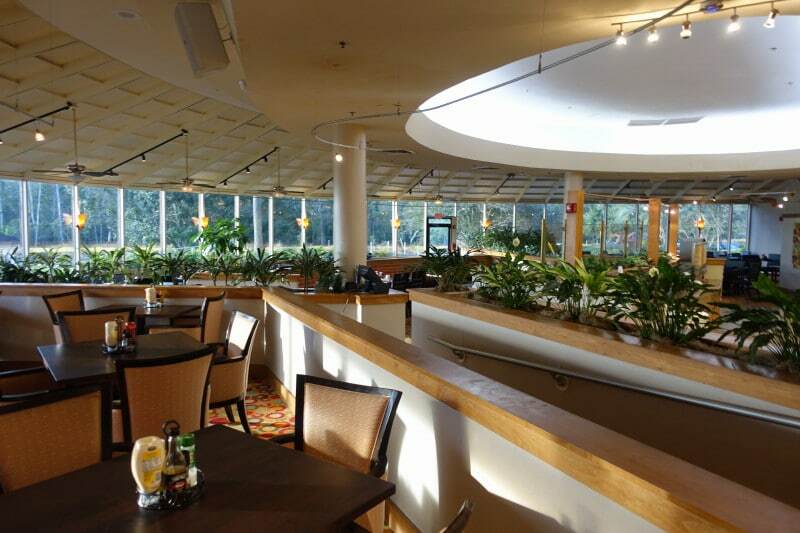 The principal dining venue at the Doubletree Suites is the Evergreen Cafe, serving a breakfast buffet, and also lunch and dinner, and which also has an attached bar. 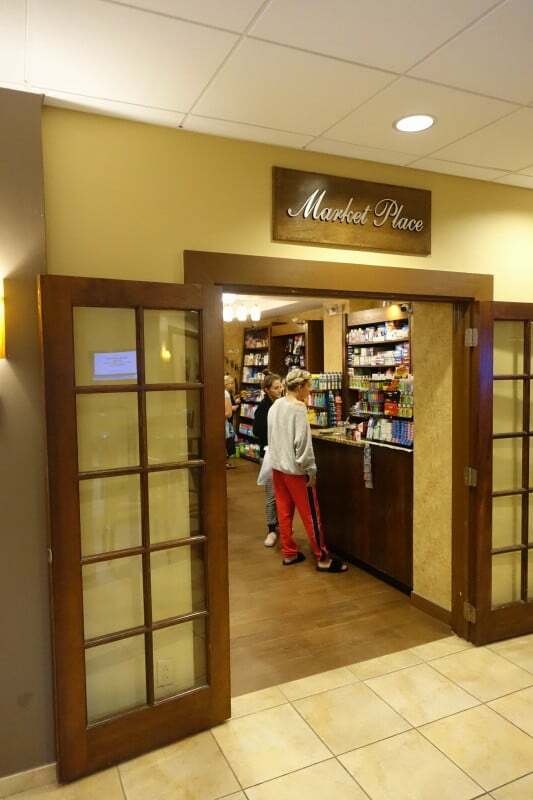 Snacks, drinks, and grab and go items are also available in a small but well-stocked shop near it. A pool bar might also offer food, but it was closed during my stay here. 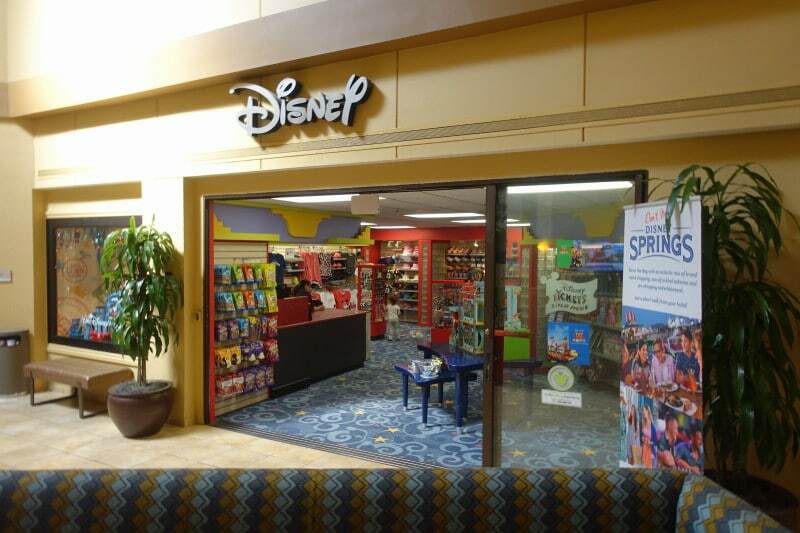 There’s also a Disney gift shop offering souvenirs, park tickets and such off the lobby. 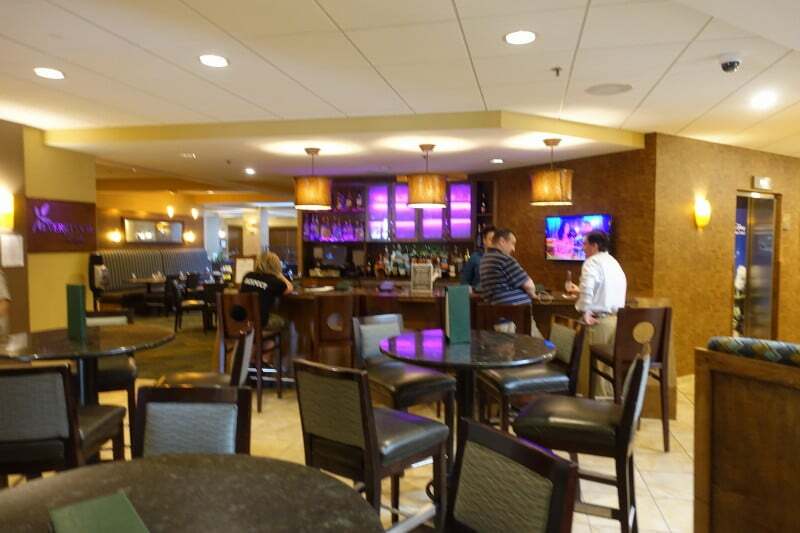 There’s more on dining–and the other amenities here, except for the pool–at the Doubletree Suites here. The pool at the Doubletree Suites has the basics–a pool and a hot tub–but nothing else–at least not that I noticed. It is adequate, but in the bottom rank of the pools at the Disney Springs Resort Area hotels. 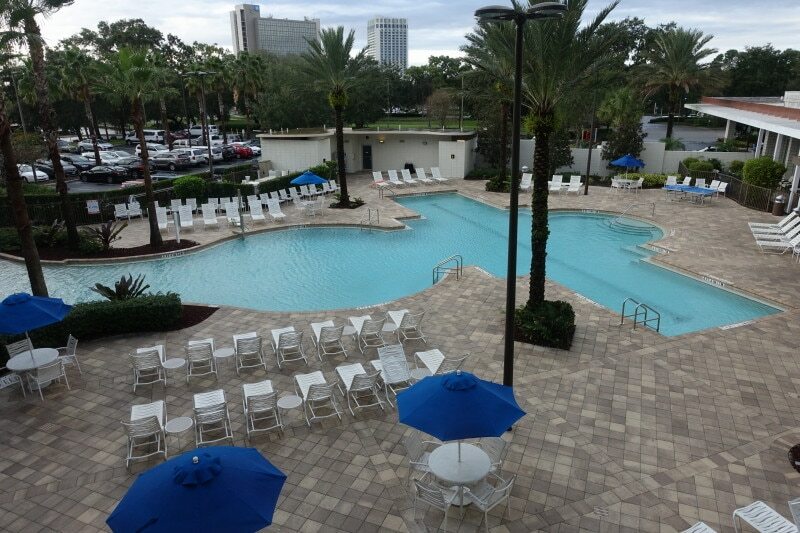 For more on the pool at the Doubletree Suites, see this. 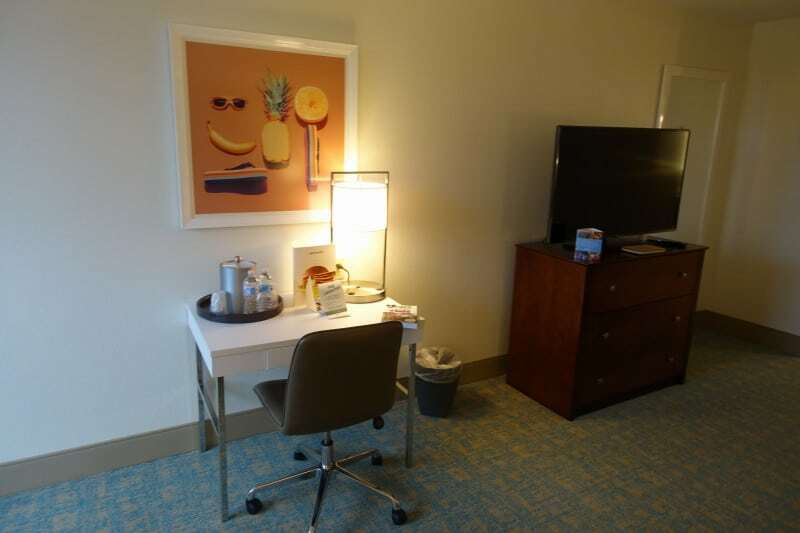 The Doubletree Suites participates in a transportation program sponsored by all the Disney Springs Resort Area hotels. 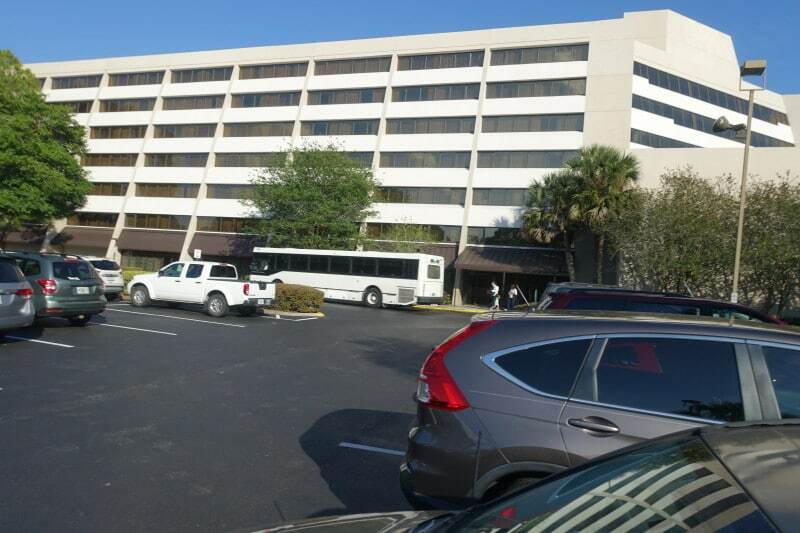 One group of buses serves the four hotels on the side of Hotel Plaza Boulevard that the Doubletree Suites is on, and another group serves the two hotels on the other side and the Hilton Palace on Lake Buena Vista. Having your own car or a rental is a much better option. 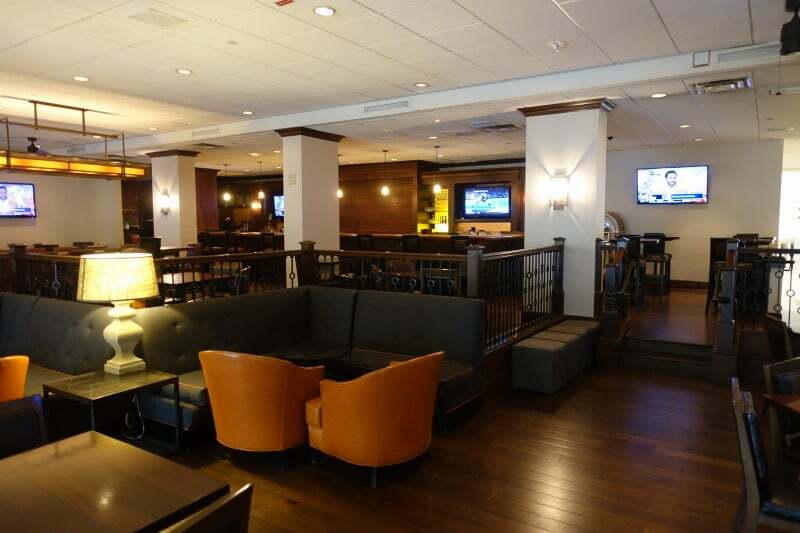 Self-parking at the Doubletree Suites is $22/night and valet parking is $27/night. Parking at the theme parks is $25/day. Pricing at the Disney Springs Resort Hotels is much less visible than that at the Disney-owned resorts, and multiple prices for the same room e.g. for non-refundable stays, stays by folk with AAA, etc. are common. Discounts and deals are also common, especially for the hotels without significant convention business, and these hotels commonly show up on the various hotel deal sites. Pricing for most of them is also obscured by mandatory “resort fees.” Resort fees are added every night of your stay, whether you like or not. I personally find mandatory resort fees a misleading and unethical practice. 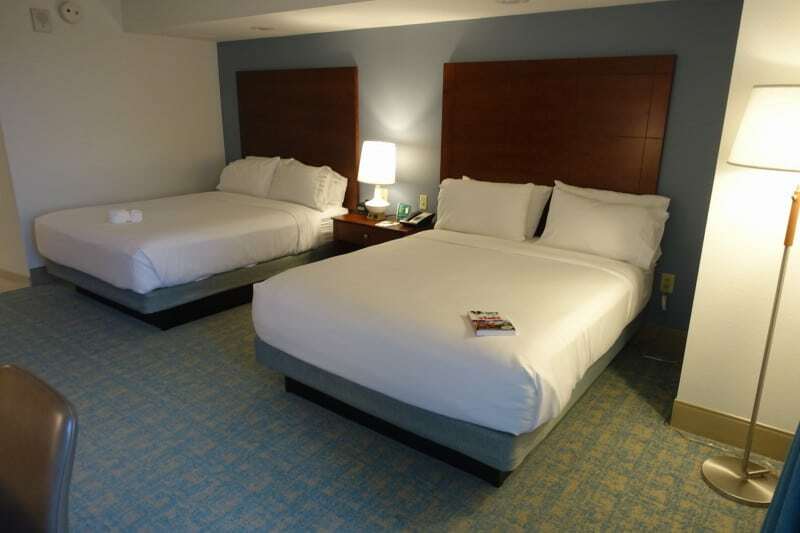 A fee that is mandatory, and charged each night, should simply be rolled into the nightly room price. 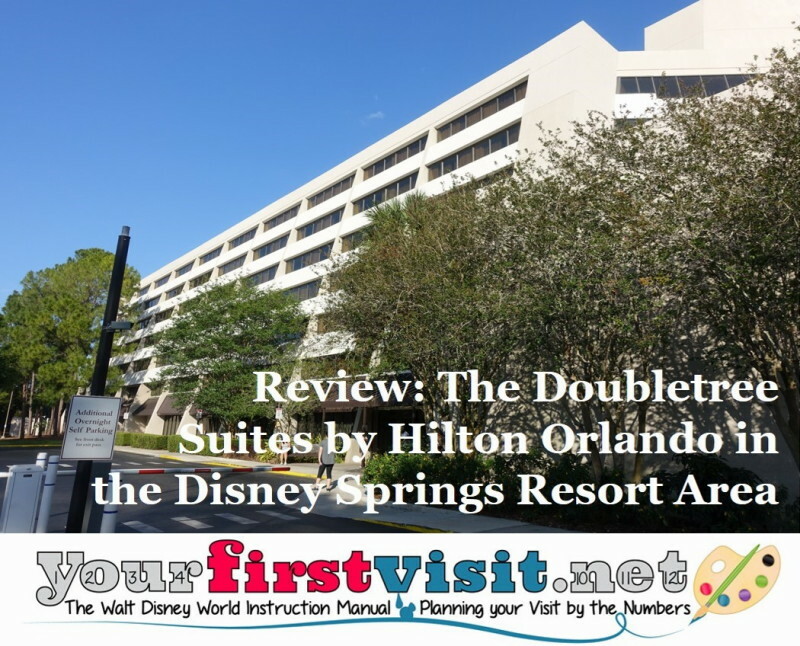 The Doubletree Suites by Hilton Orlando, bless its soul, is the only one of the seven Disney Springs Resort Area hotels that does not charge a resort fee. I honor it for not doing so. 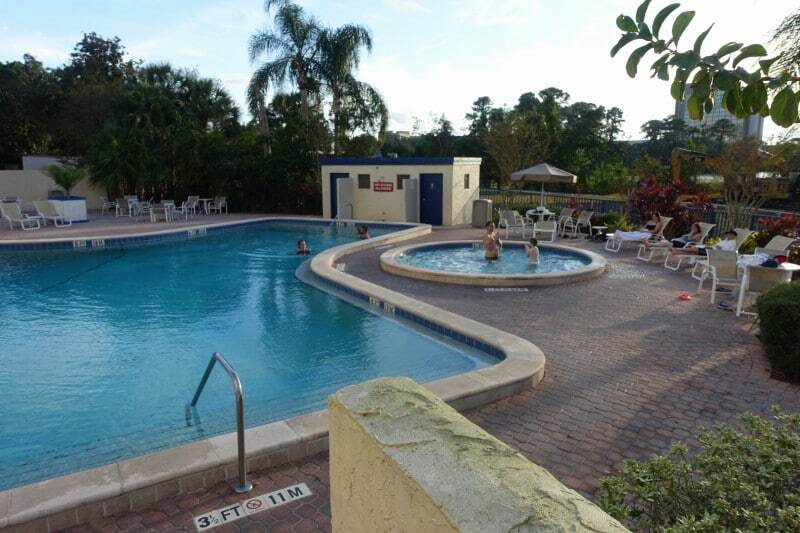 Prices at the Doubletree Suites (before any discounts) are otherwise generally a bit more than a single bay four person room in a Disney-owned value resort, and less than a single bay four or five person room in a Disney moderate resort. 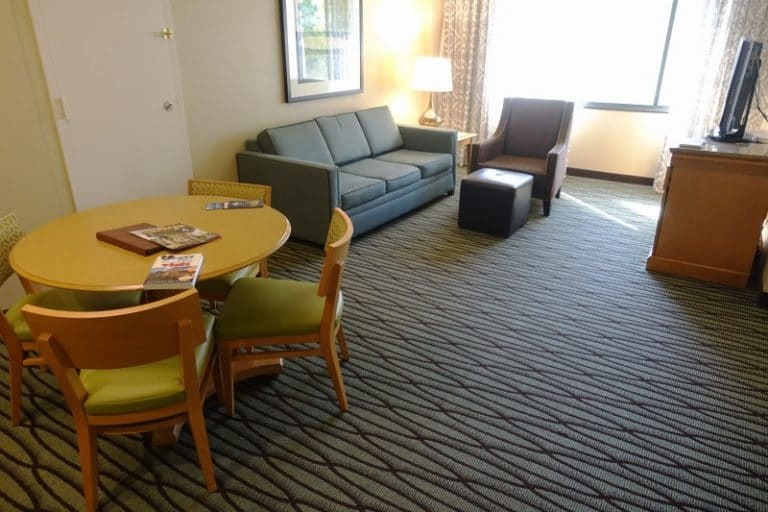 For some large families on a tight budget, the ability to sleep six here might trump any other issue with the Doubletree Suites. But, as noted, the rooms awkwardly fit the six they sleep (the undivided bath, lack of access to it from both sleeping areas, four person table, and seating for four in living room area). 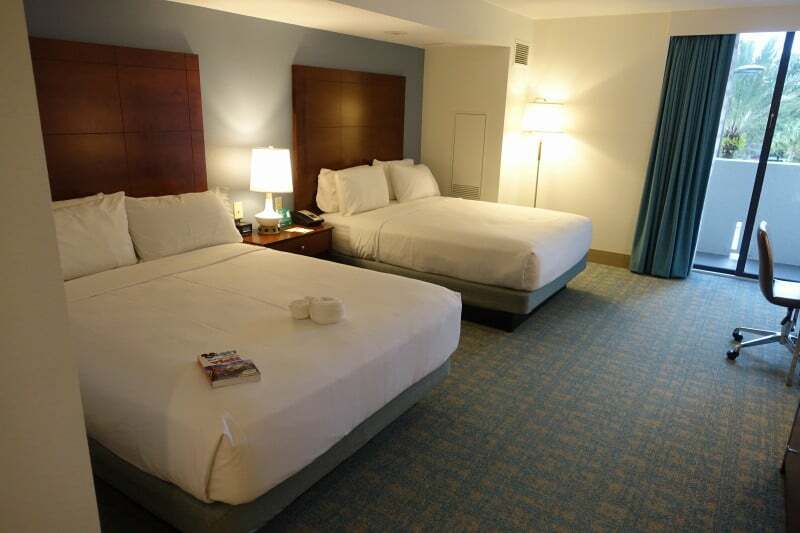 These rooms are better seen as affordable but more spacious alternatives for smaller families to other Disney Springs Resort Area options, and perhaps, if you can get them on deal, to standard rooms at Disney’s value resorts. 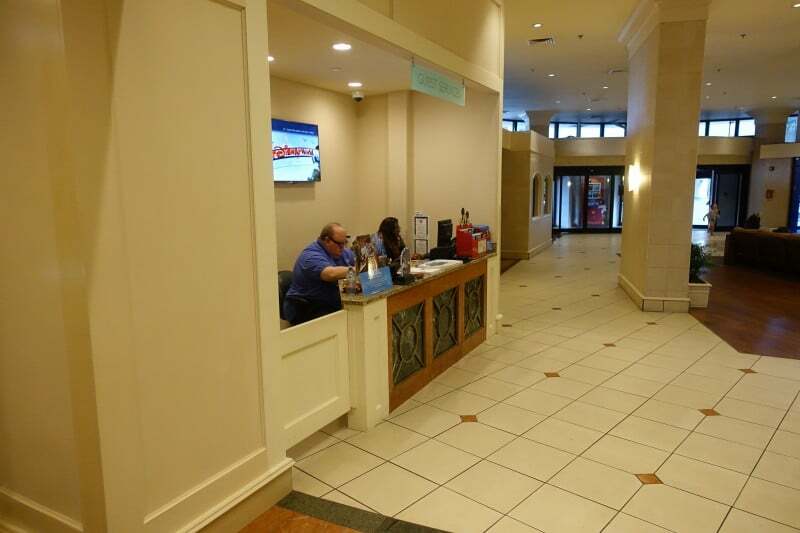 Kelly, the long-time travel agent partner of this site, can book your Disney World vacation at the Doubletree Suites–or at any other Disney World hotel. Contact here using the form below. 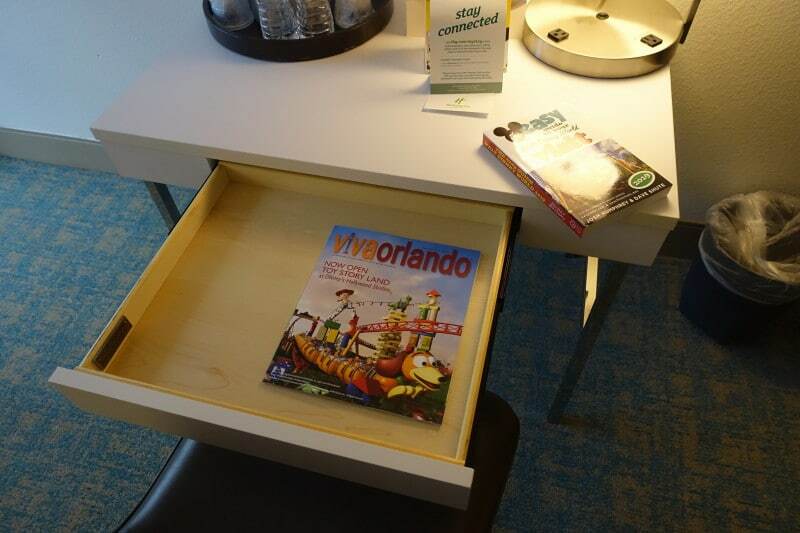 For the first page of this review of the Hilton Orlando, see this. You enter the Hilton Orlando Lake Buena Vista in the Disney Springs Resort Area–an entirely different hotel than the nearby similarly named Hilton Buena Vista Palace–at its front, where you can either valet your car or, if self-parking, leave it until you have completed check in. 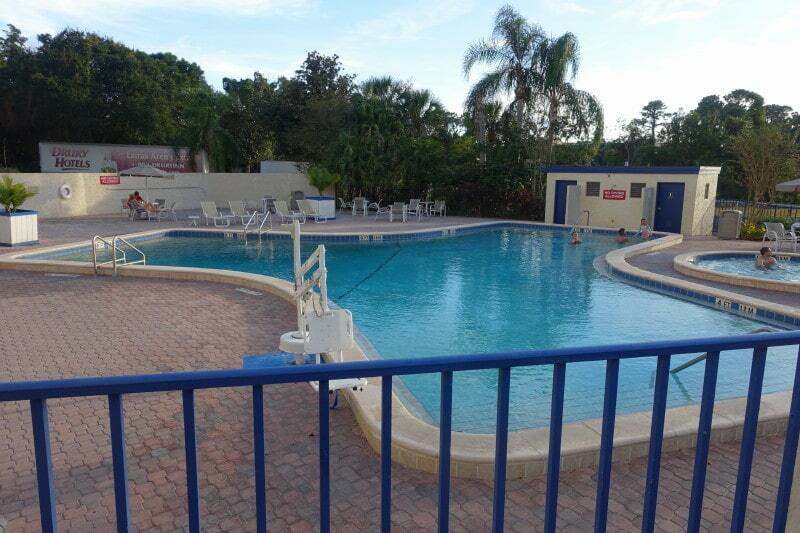 All amenities except the pool are just inside on the first floor, including the check-in area. 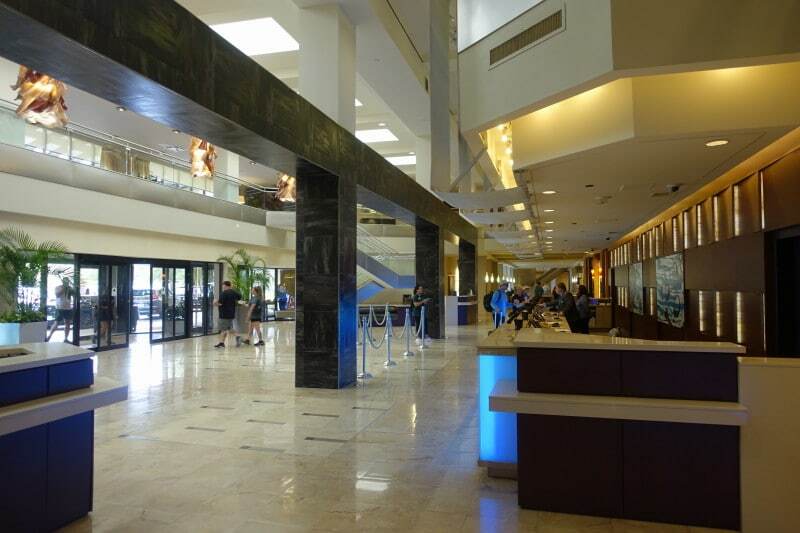 Dining and other amenities are mostly along the long corridors on either side of the lobby. 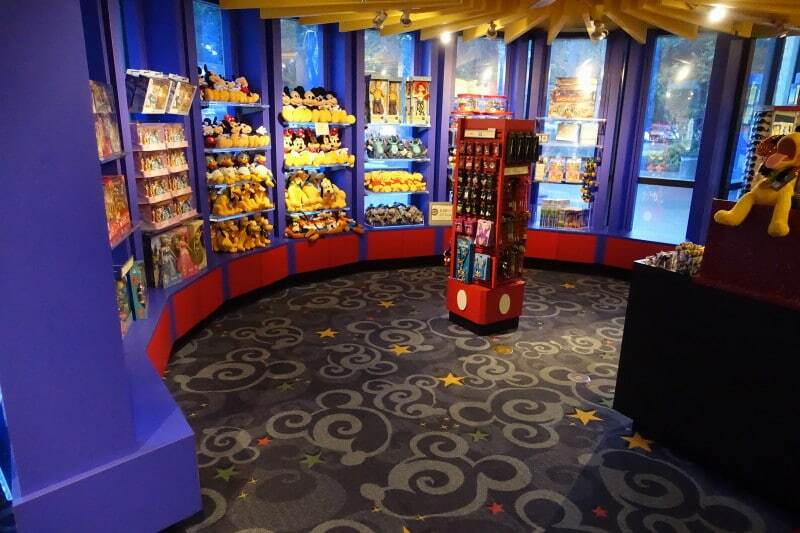 On one side you’ll find a Disney gift shop. 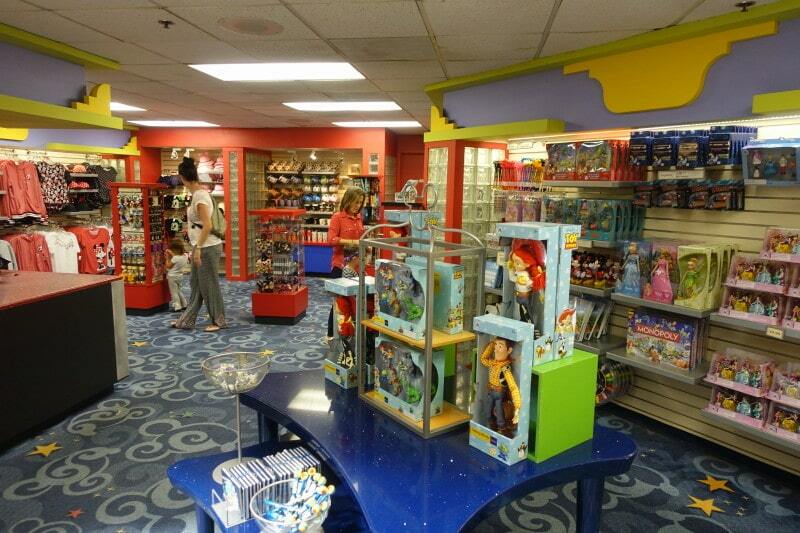 More from inside the Disney shop. 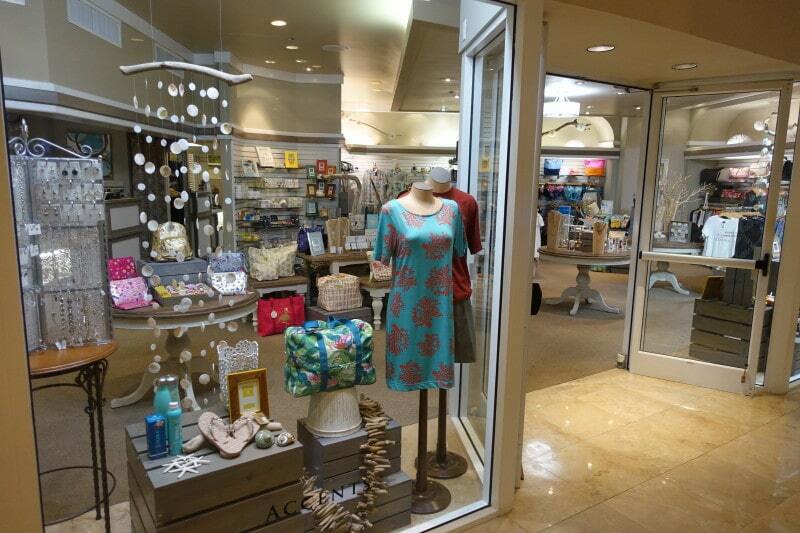 Next to it is a more traditional resort-wear shop. 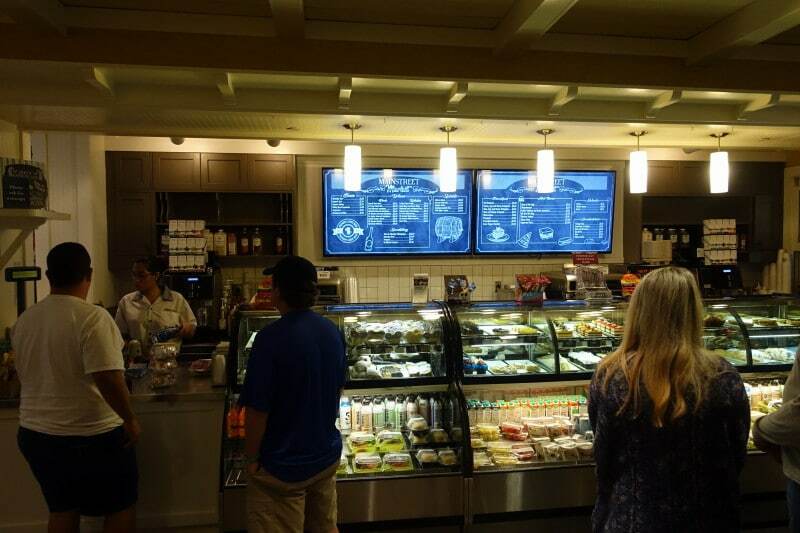 On the other side of the check-in desk is yet a third shop–shopping is better at the Hilton Orlando Lake Buena Vista than any other Disney Springs Resort area hotel–that focus on coffee, pastries, other snacks, cold drinks, and grab and go items. 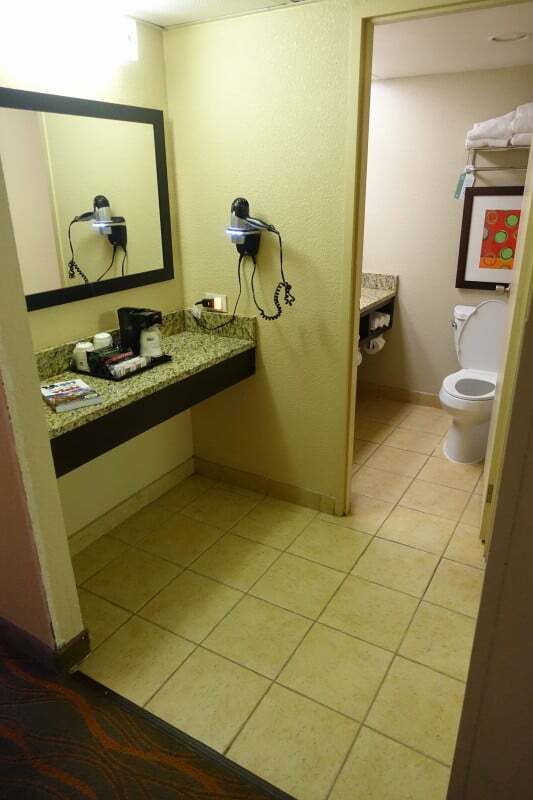 …both nicely convenient to a nearby bar. …and beyond the other is the stop for theme park buses (and for Disney Springs in the late afternoon and evening). 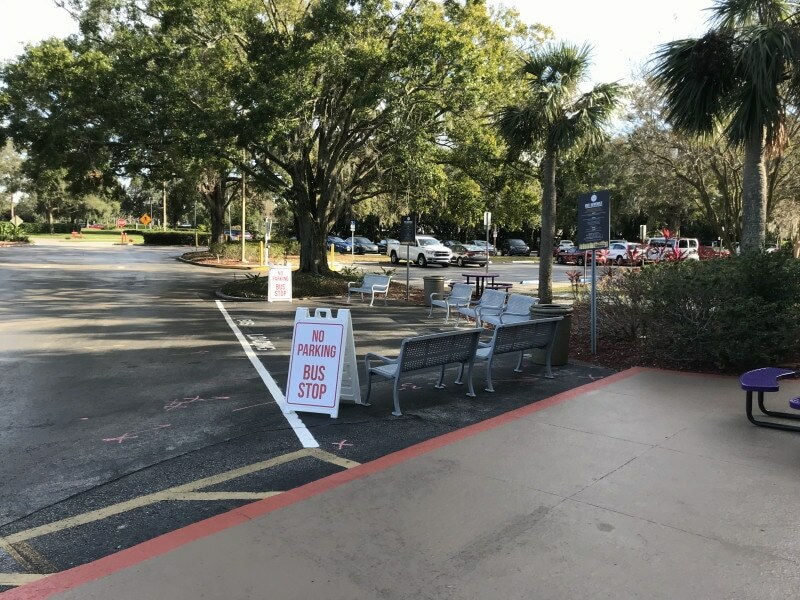 While none of the Disney Springs Resort Area hotels does a bad job communicating about its buses, the Hilton does the best. 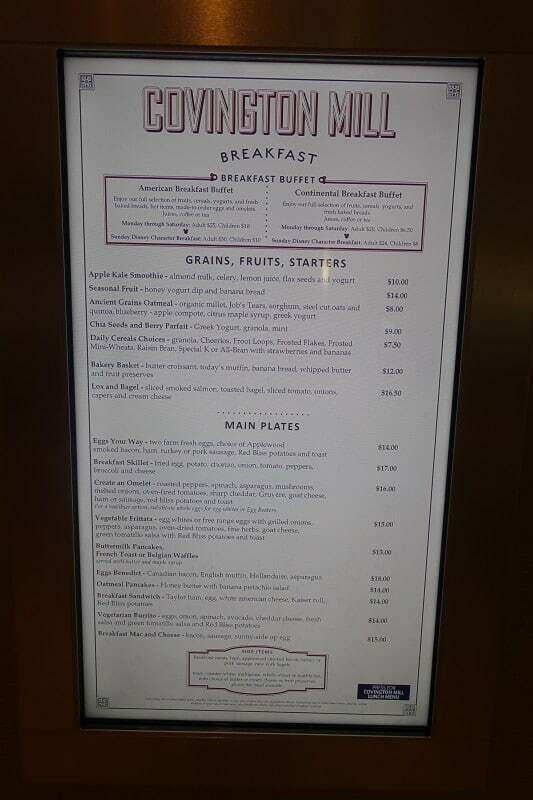 The Hilton is distinct among the Disney Springs Resort Area hotels in having three table service restaurants. Covington Mill is the most family-friendly, and the only one open for breakfast and lunch (it closes at 3p–it does not serve dinner). 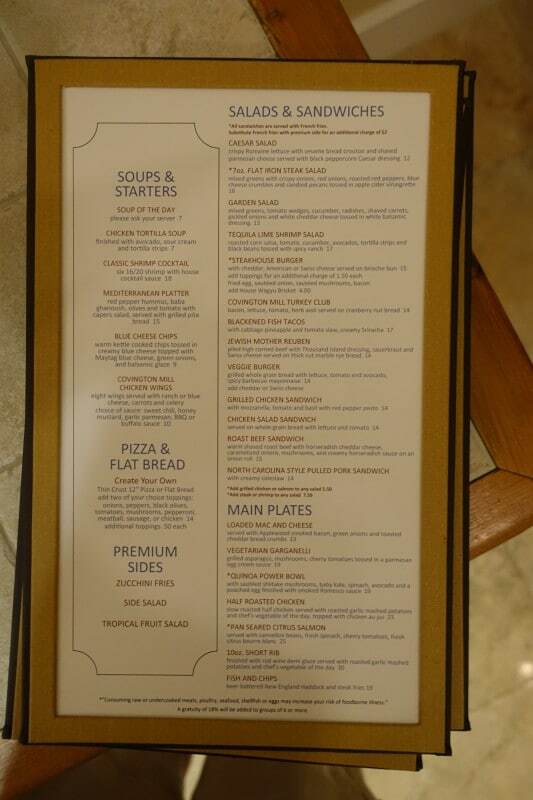 The Covington Mills lunch menu. 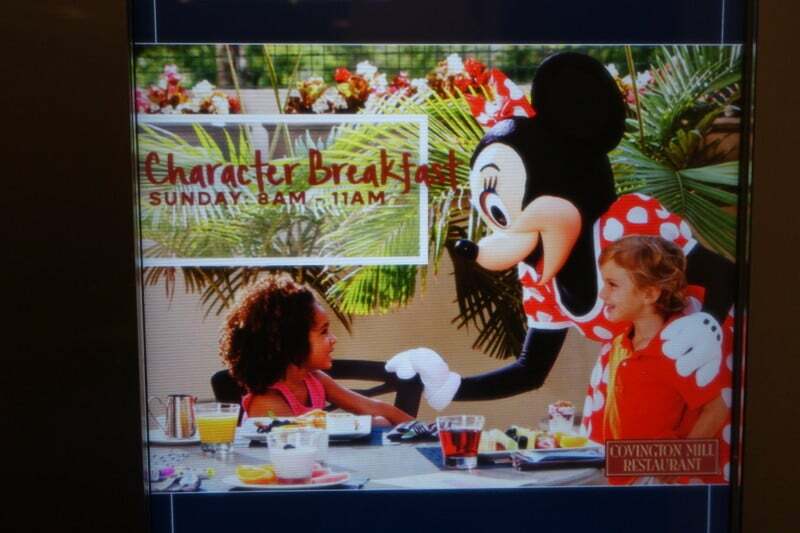 Character breakfasts occur here on Sundays. 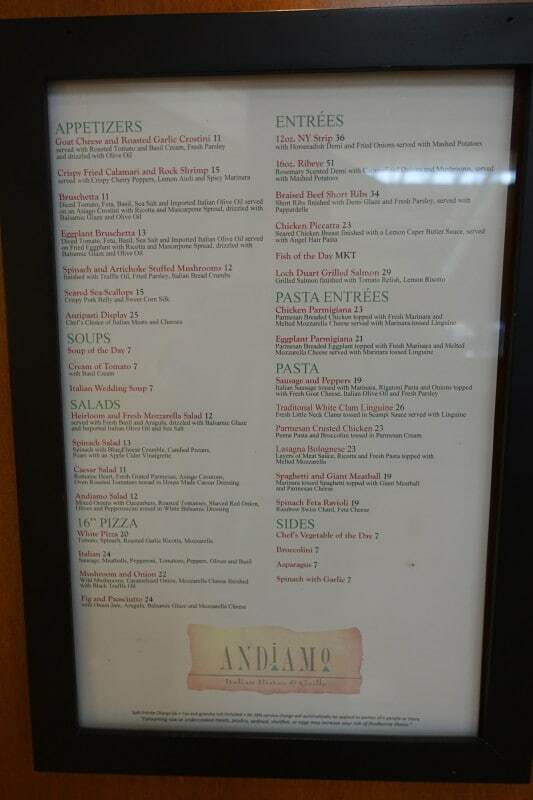 Andiamo is a bit more upscale. 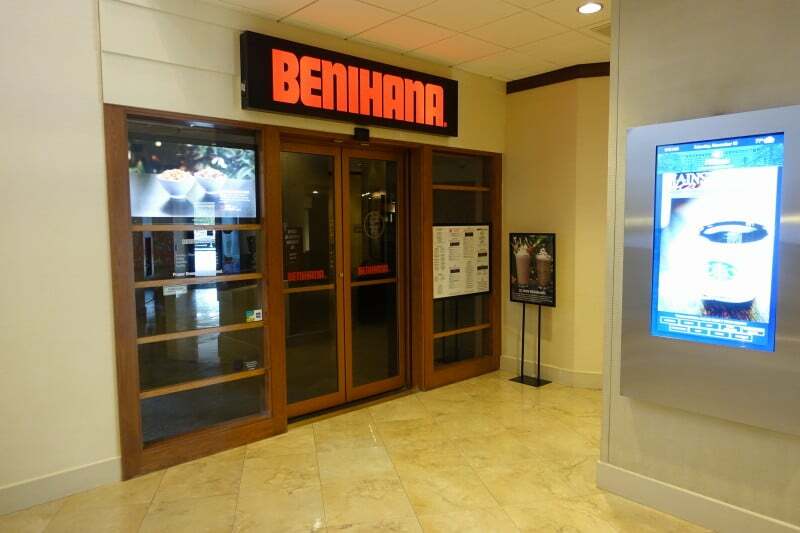 Benihana rounds out the table service options. 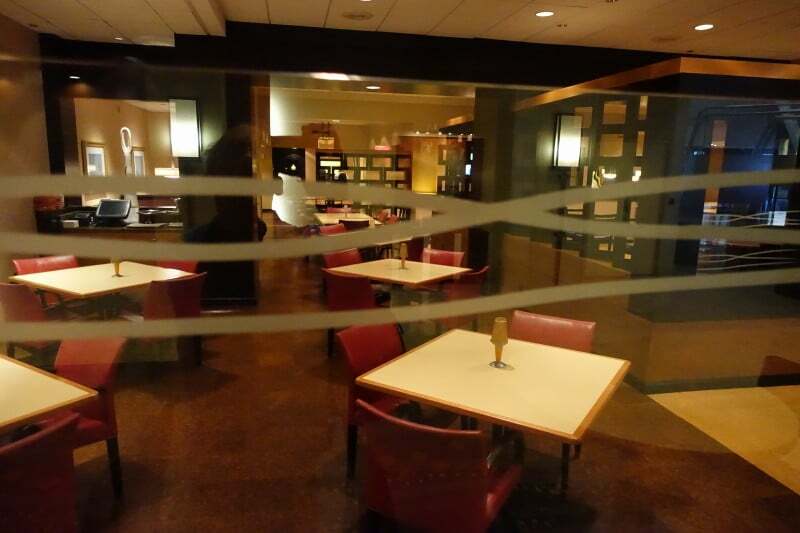 More details on the dining at the Hilton, including links to menus, is here. Including its pool complex, the Hilton Orlando Lake Buena Vista in the Disney Springs Resort Area has as complete and extensive a set of amenities as any other Disney Springs Resort Area hotel. For adults, who will perhaps appreciate the most suc offerings as Benihana and the traditional resort gift shop– it probably has the best amenities. 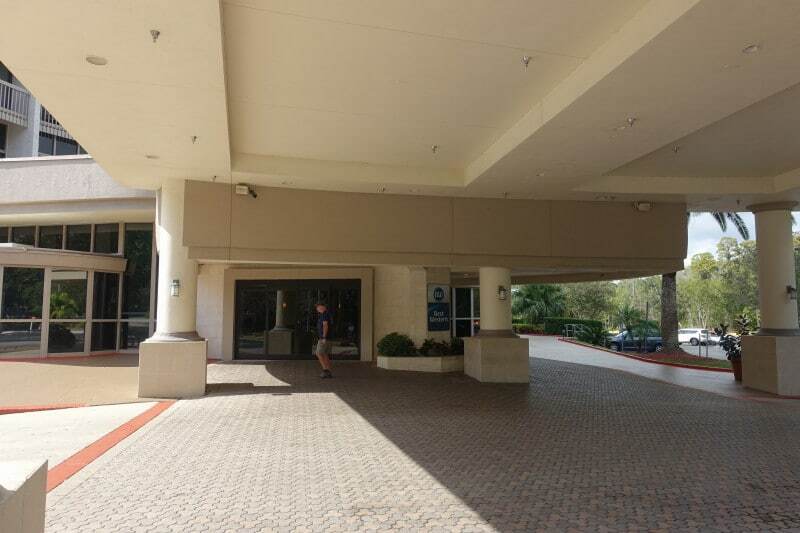 You enter the Doubletree Suites by Hilton Orlando in the Disney Springs Resort Area through its port cochere, where you can park for check-in or turn your car over to the valet. Also near here is the stop for theme park buses (and for Disney Springs in the late afternoon and evening). 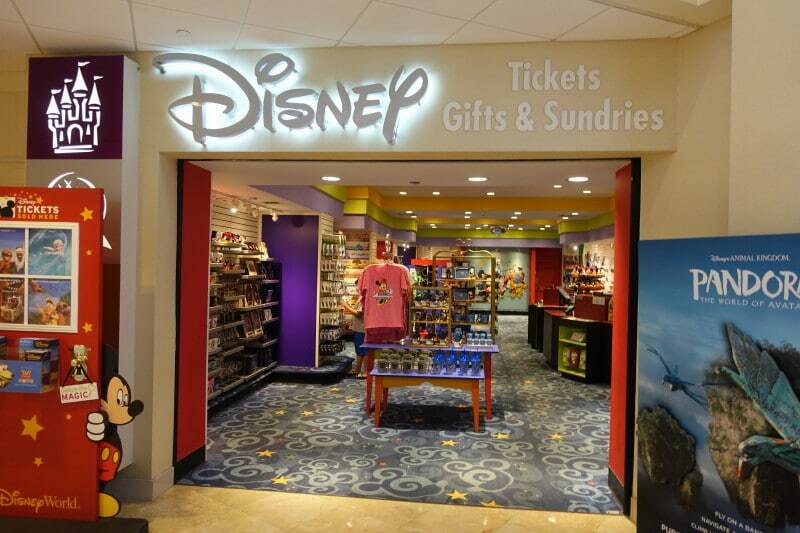 …and a Disney gift shop. More from the Disney shop. 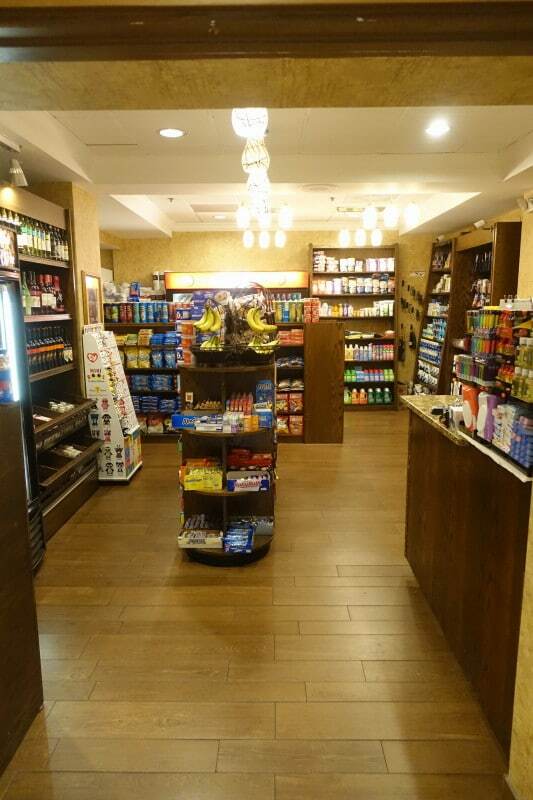 Another shop focuses more on snacks and drinks. Not large, it is quite stuffed with stuff. …and also a barbecue grill (in the back center). A bar is also here. 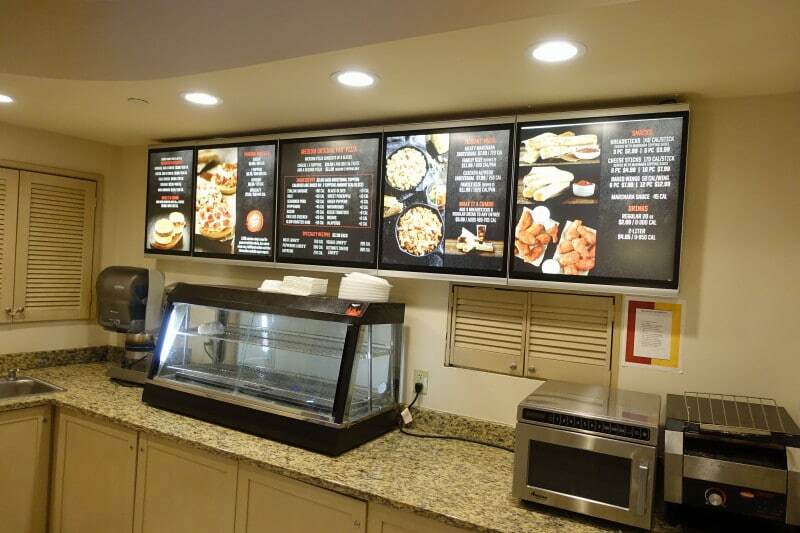 The Evergreen Cafe menu. 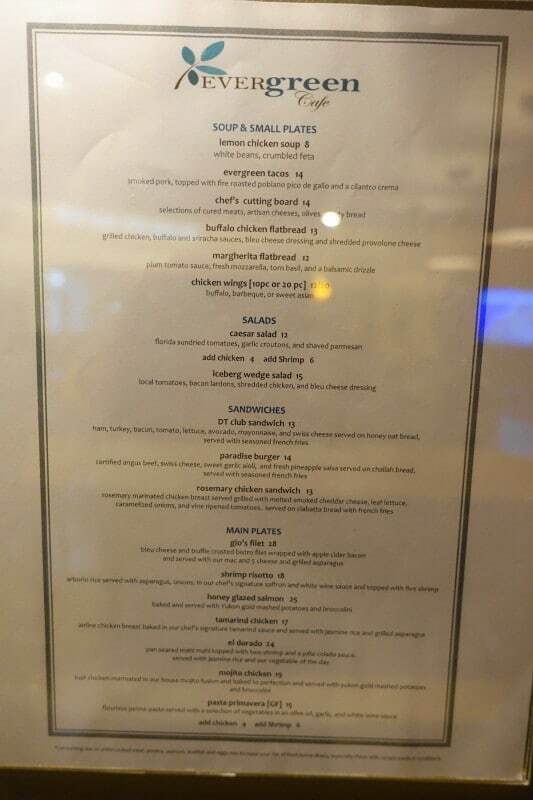 I did not have a chance to eat here on my visit, so can’t comment other than liking the menu. That said, dinner in Disney Springs is always going to be the better choice. 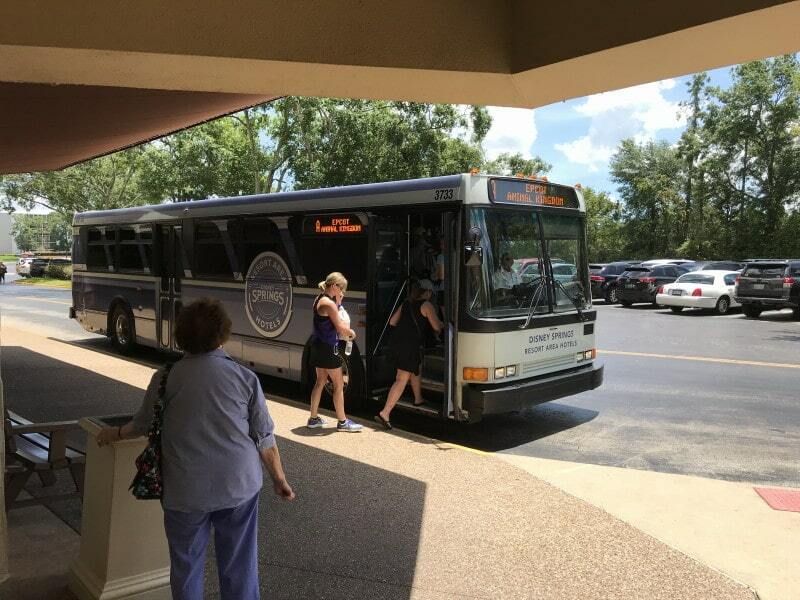 The Doubletree is tied with the Best Western among the Disney Springs Resort Area hotels for being most distant from Disney Springs, but buses are available running from late afternoon into the evening. The Best Western Lake Buena Vista in the Disney Springs Resort Area has been acquired by Drury, and construction is ongoing here. …but in January work had extended to the front parking lot. Expect more significant construction and daytime noise later. 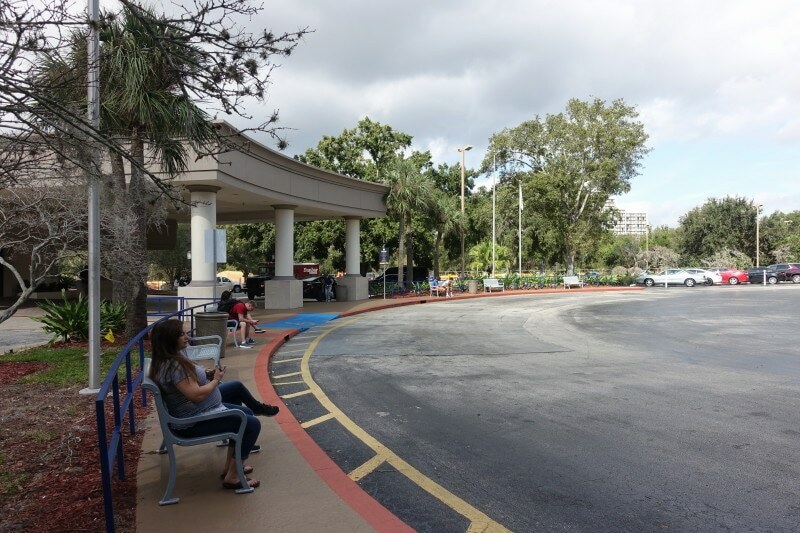 You enter at the port cochere, but check-in parking may vary depending on what is closed for construction. Just grab a nearby spot. …but on my latest visit the bus stop had been moved a bit to the former check-in parking area. 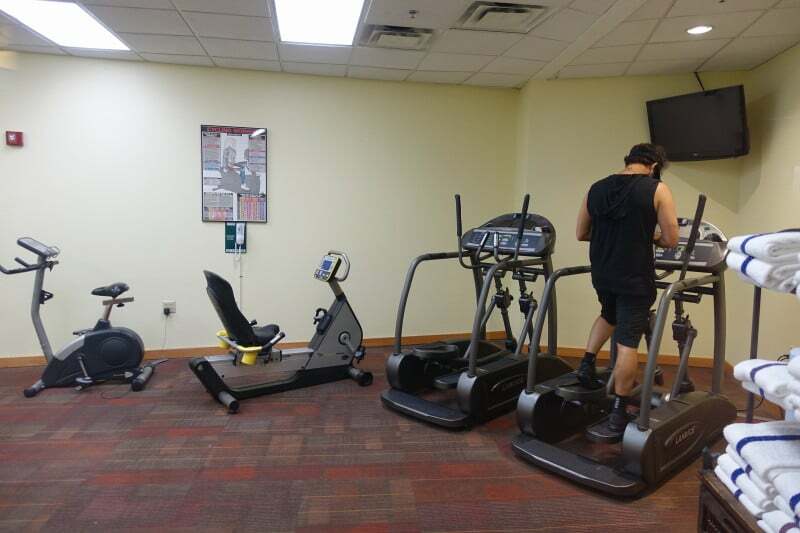 Inside, most amenities are dead ahead on the first floor. 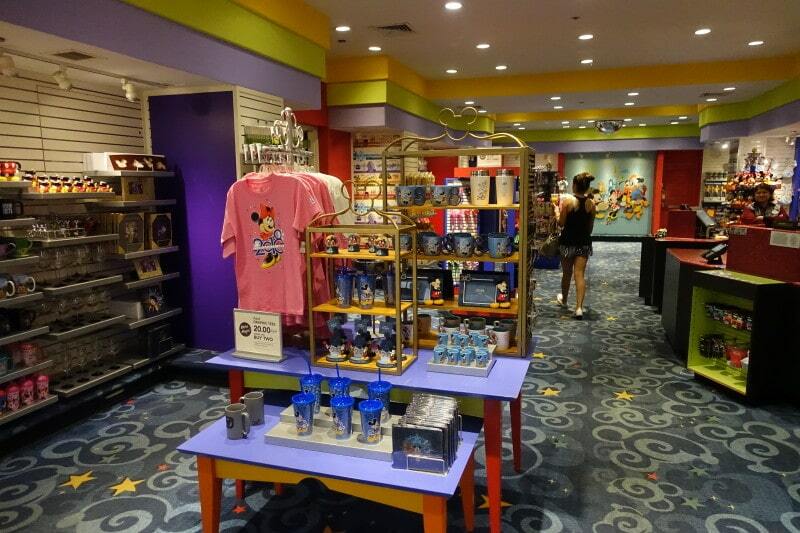 …and a small Disney gift shop. More from the gift shop. 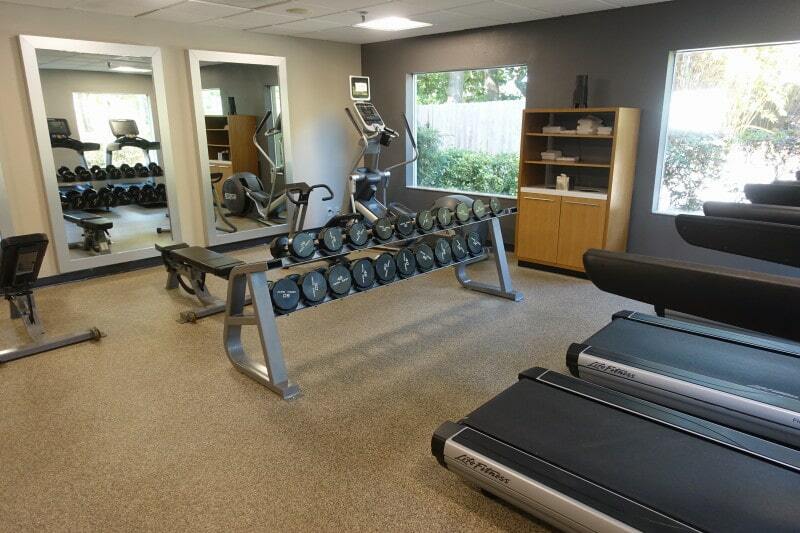 Beyond this area, on the way to the pool, is a small gym. 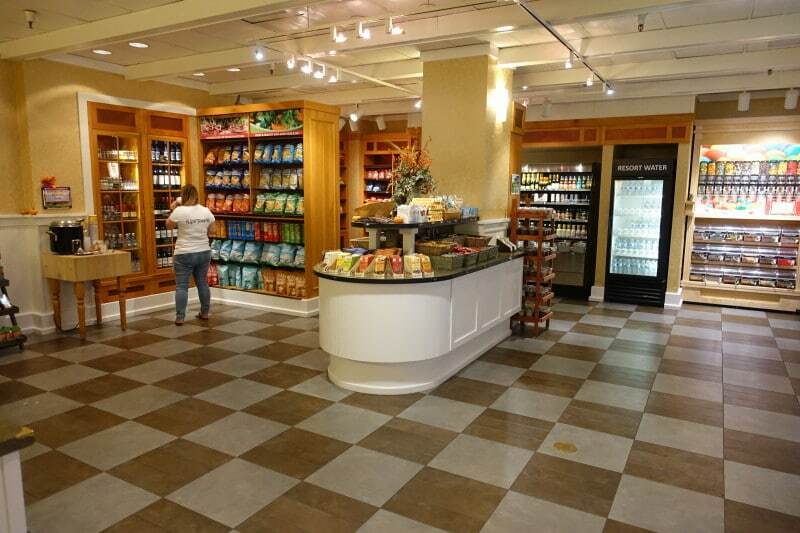 Just off the lobby is an area that serves as an additional gift shop centered on snacks, and also for grab and go food. Offerings on the hot side include pizza and wings. 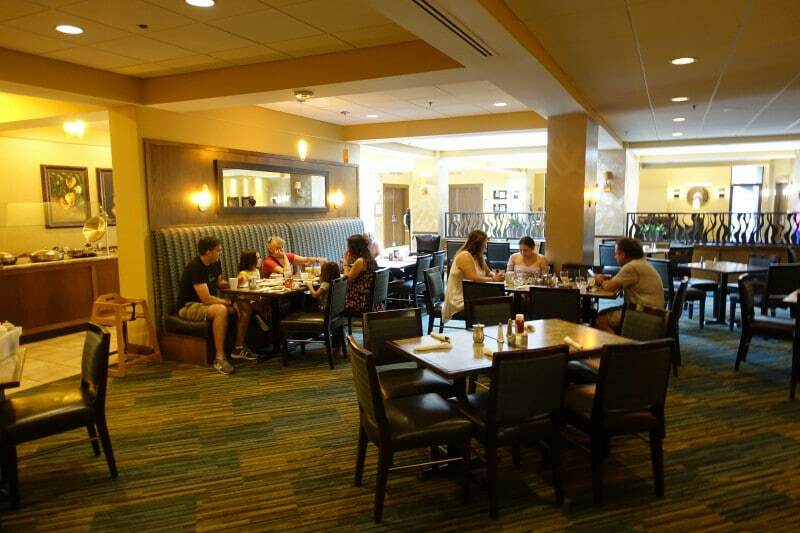 Between it and the pool area is the Best Western Lake Buena Vista’s table service offering, the Trader’s Grill. 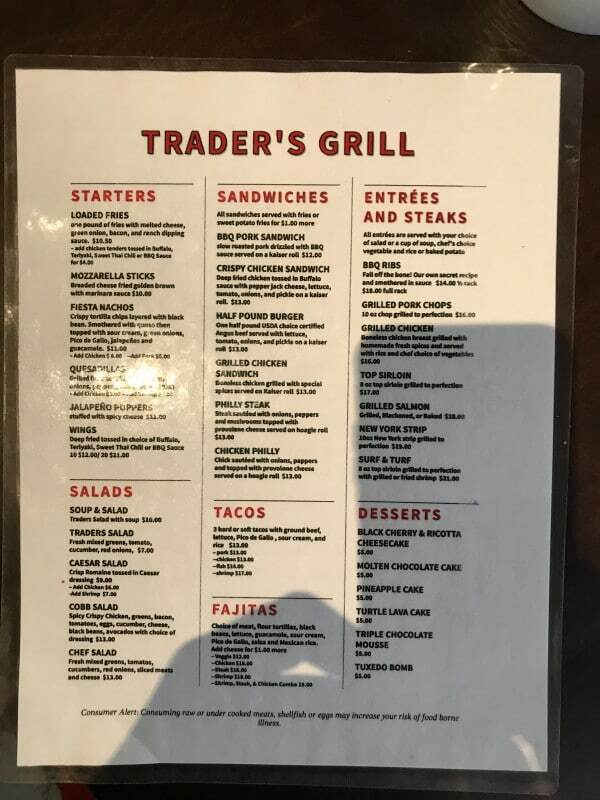 Trader’s Grill is open for a breakfast buffet ($15.99) and also dinner. When I had dinner here, I was greeted by this kinda illiterate sign. I usually test a restaurant such as this with a steak–popular, and easy to source and prepare well, so getting a poor one can be indicative, but “steam broccoli” scared me off a bit, so I went with fajitas–also easy to do well. 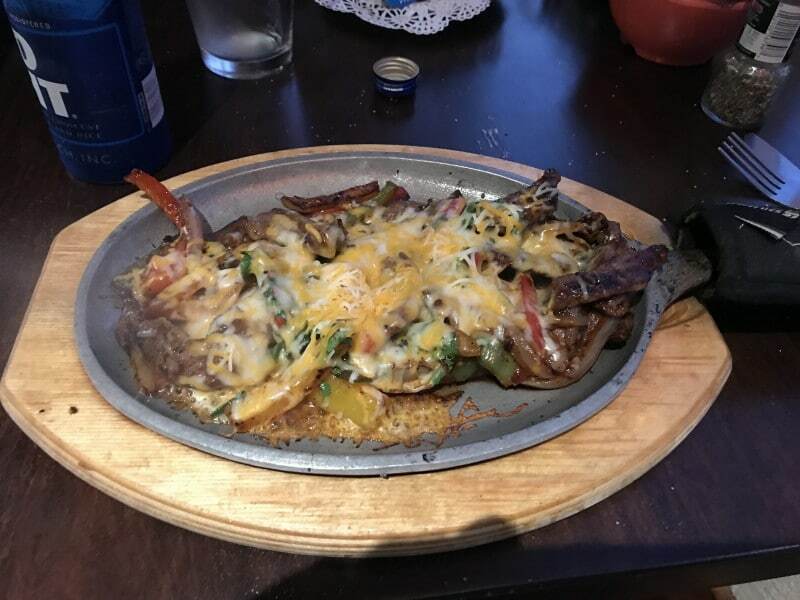 My fajitas were terrific, as was the service. 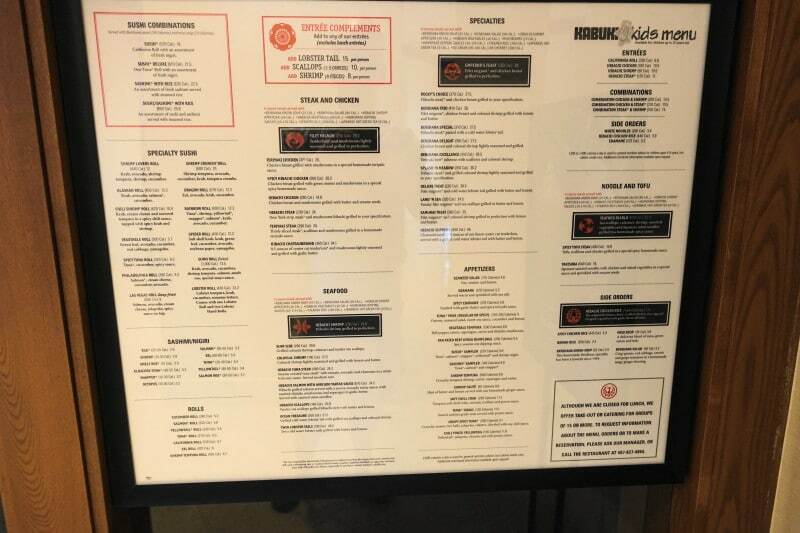 That said, while the Best Western is tied with the Doubletree Suites as the furthest of the Disney Springs Resort Area hotels from Disney Springs, dinner time buses make dinner in Disney Springs easy to manage, and much the better choice. 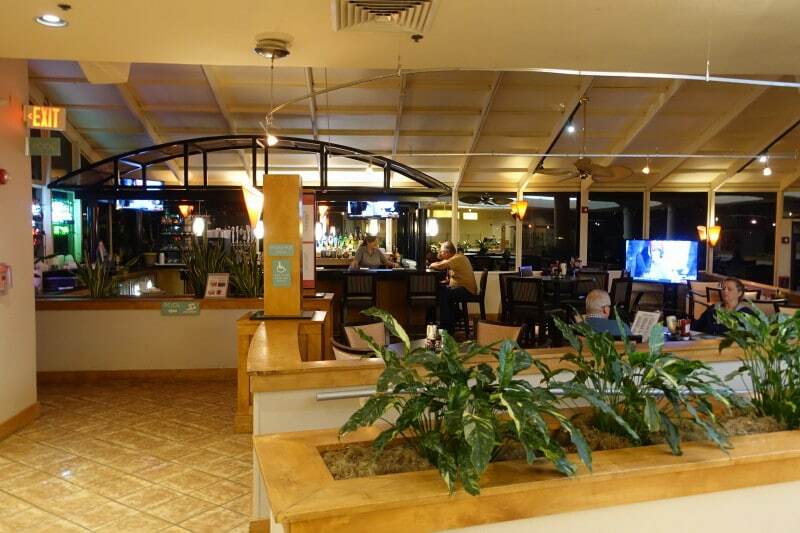 You’ll find a bar between the restaurant and the pool. Go past the bar and you’ll find the pool. 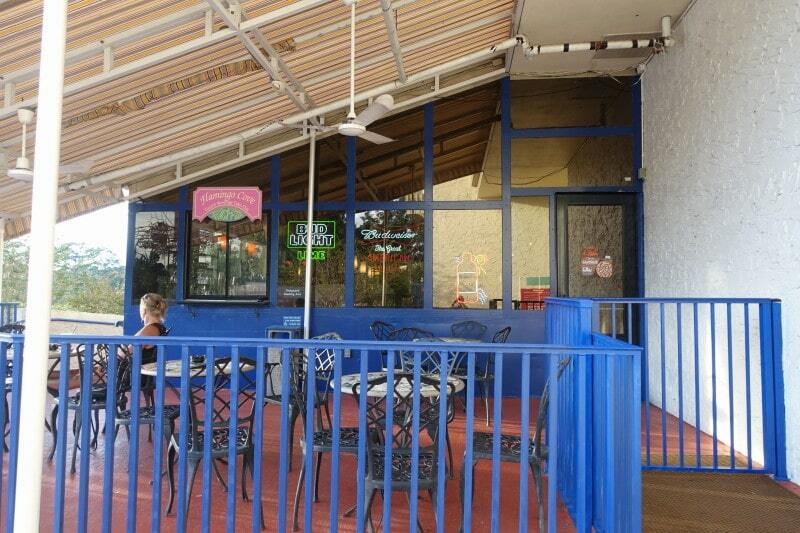 The bar has an outdoor seating area that’s very convenient to the pool. …and a good-sized hot tub. 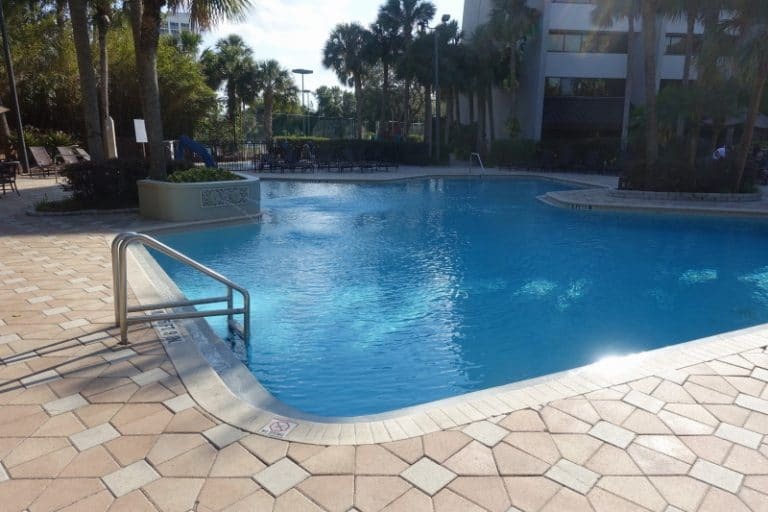 This pool is adequate, but you will find better options at any other Disney Springs Resort Area hotel, except perhaps the Doubletree Suites, which while better, is not much better. 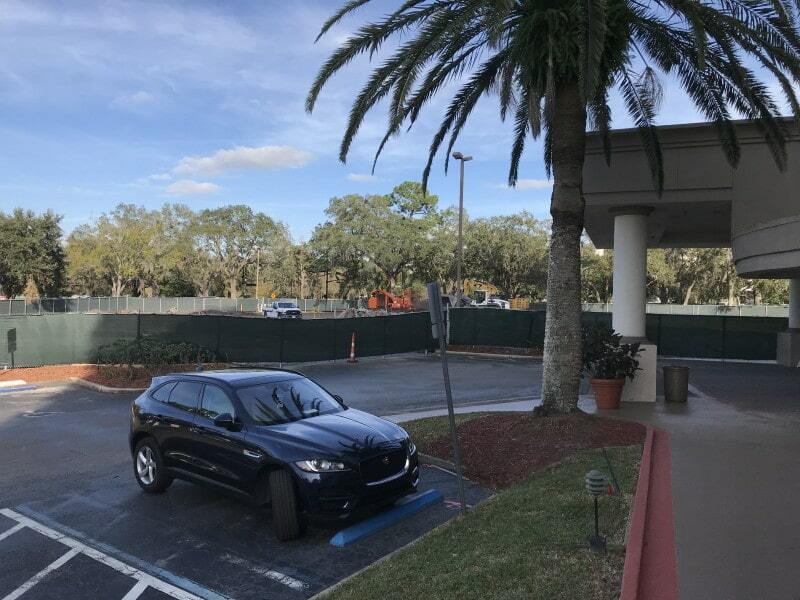 With the so-so location, dining, and pool, and the prospect for construction noise, I would hold off on booking the Best Western Lake Buena Vista in the Disney Springs Resort Area unless you can find a real deal, at least until the construction here is complete. And I hope that a part of the construction will include an expanded pool set up with more amenities–in the construction paperwork I’ve seen, the approach to the pool is labeled “Design in Development”…. 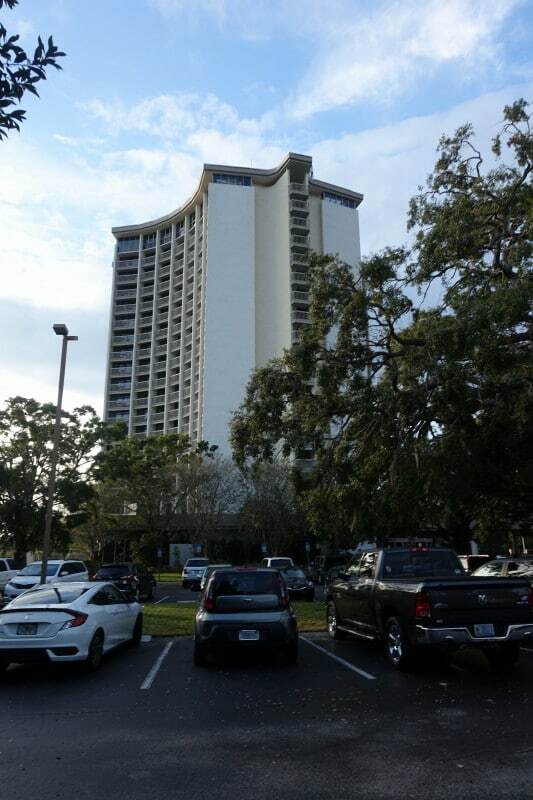 The Holiday Inn Orlando in the Disney Springs Resort Area has two accommodations buildings. One is a mid rise tower where you will find regular rooms. 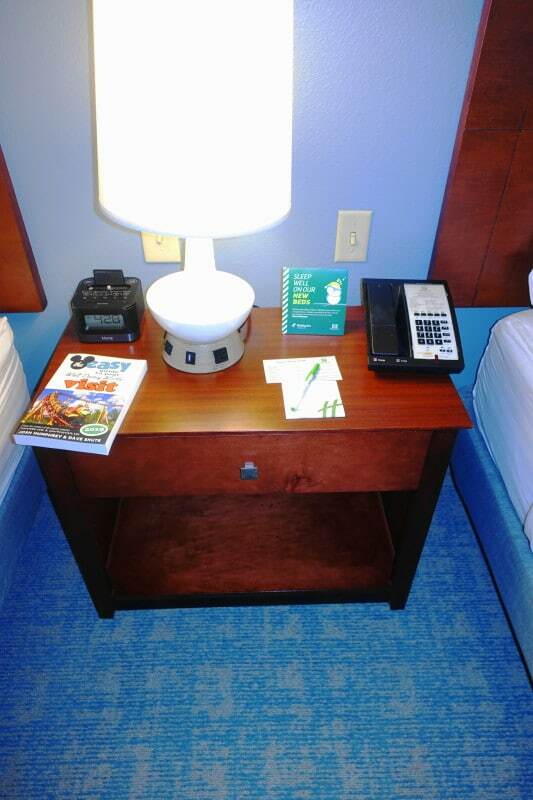 I have a photo tour of a tower room at the Holiday Inn Orlando here. The other is a six story building where most rooms have pool views. and are sold as such. 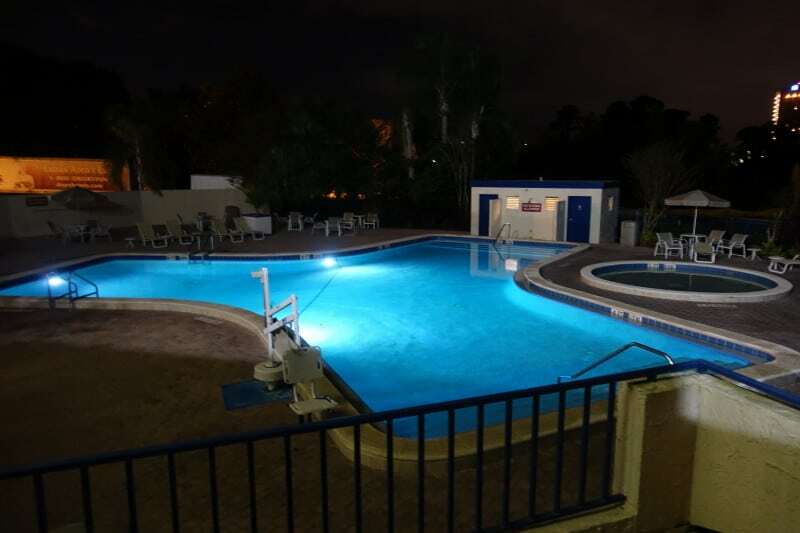 This photo tour is of a pool view room at the Holiday Inn Orlando. 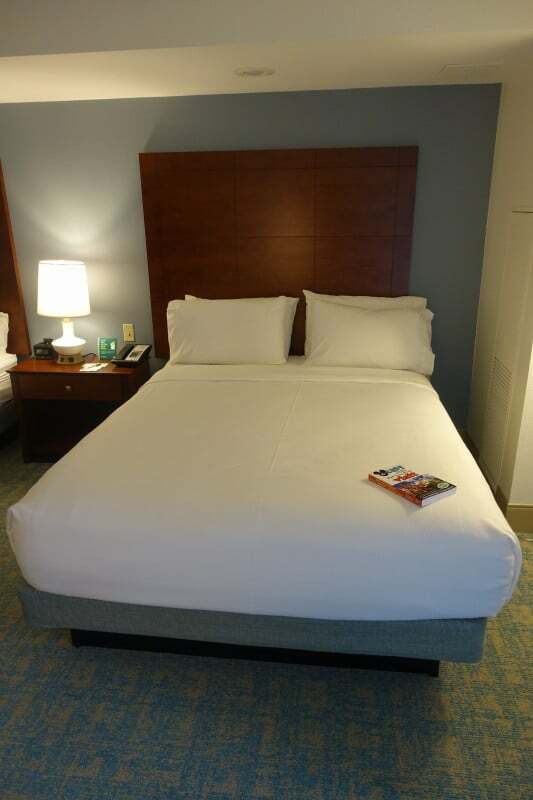 Two queen bed pool view rooms are very similar to tower rooms–I got most dimensions within a couple of inches–with a couple of minor exceptions. First, there’s an angle to the bath wall that makes the bedroom space feel a bit more open and spacious. 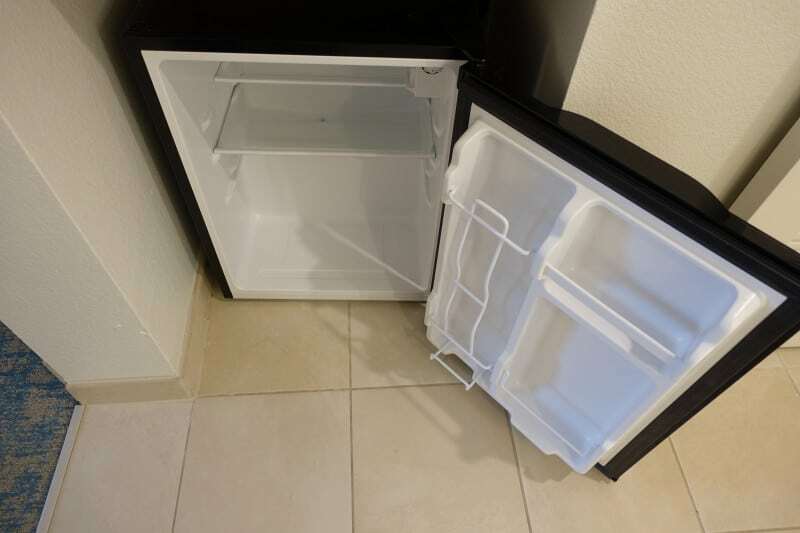 Second, the mini-fridge–at least in my room–did not have the freezer compartment that my tower room had. These rooms all have microwaves, and microwaves are a bit more useful if you can also keep your Stouffers macaroni frozen. 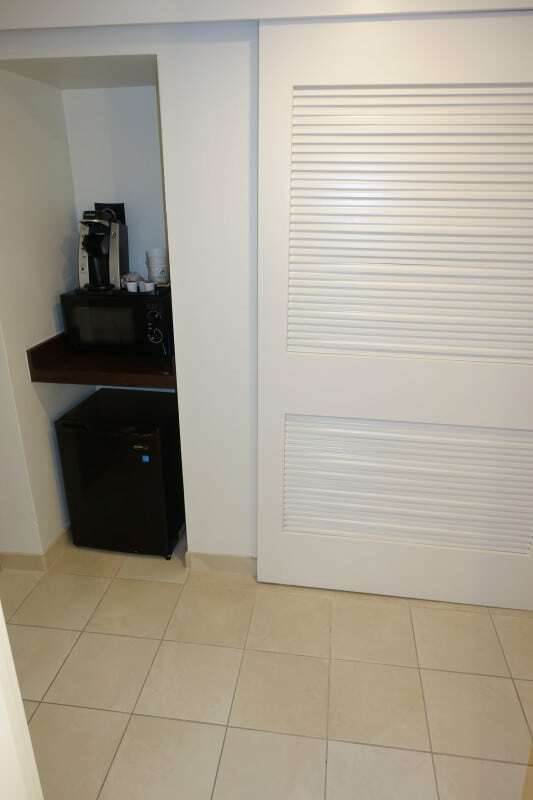 As you enter the room, the closet, mini fridge, and coffee service are one side, and the bath on the other. The undivided bath has the basics. Across the hall is the closet and other stuff. Inside the closet. Note the safe. 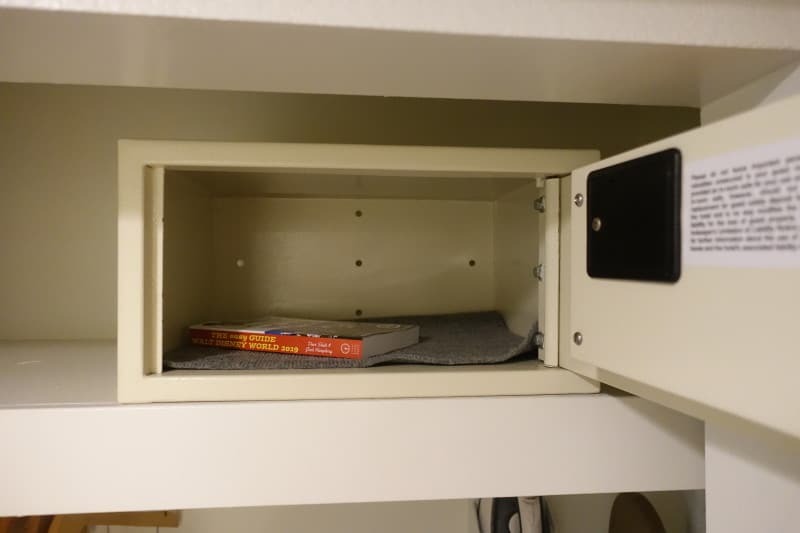 I did not measure the safe, but my book is 6″ by 9″, so it’s plenty big. 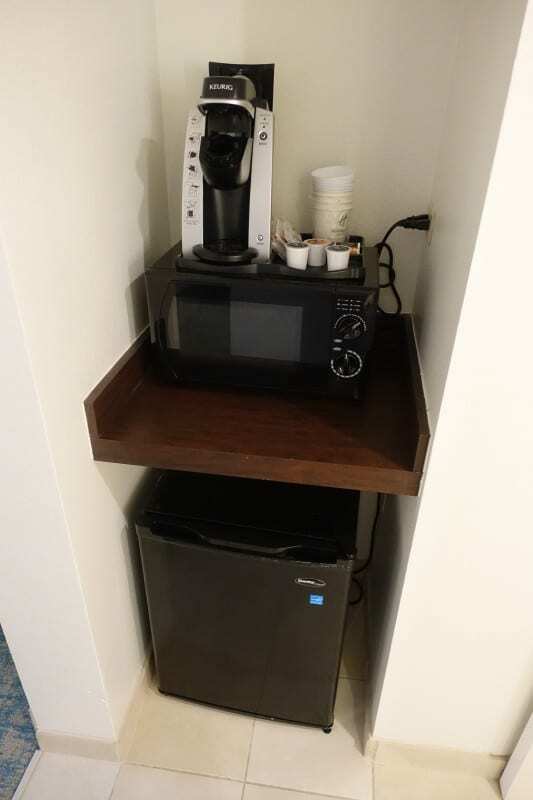 Next to the closet is the mini fridge, microwave, and coffee service. Inside the mini-fridge. Note the absence of a freezer compartment, which makes the microwave less useful. Beyond this area you’ll find two queen beds on one side of the room. The bed side from the back of the room. 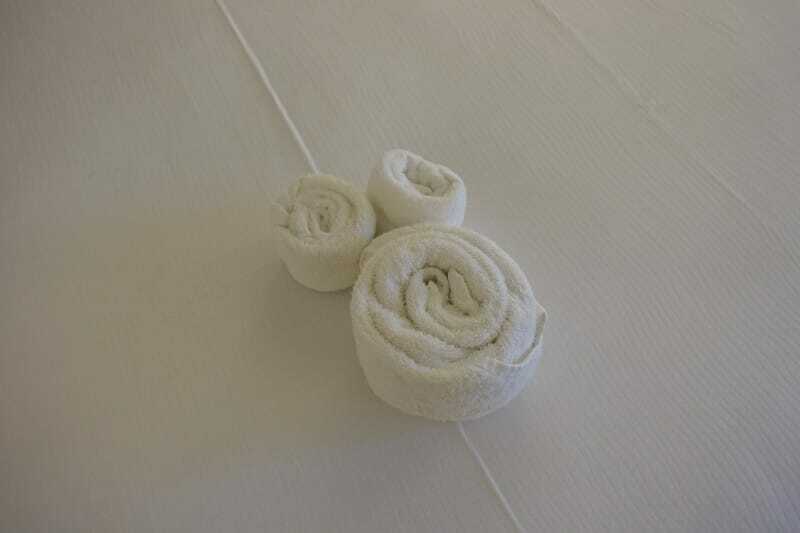 …and of the towel animal, rare these days. 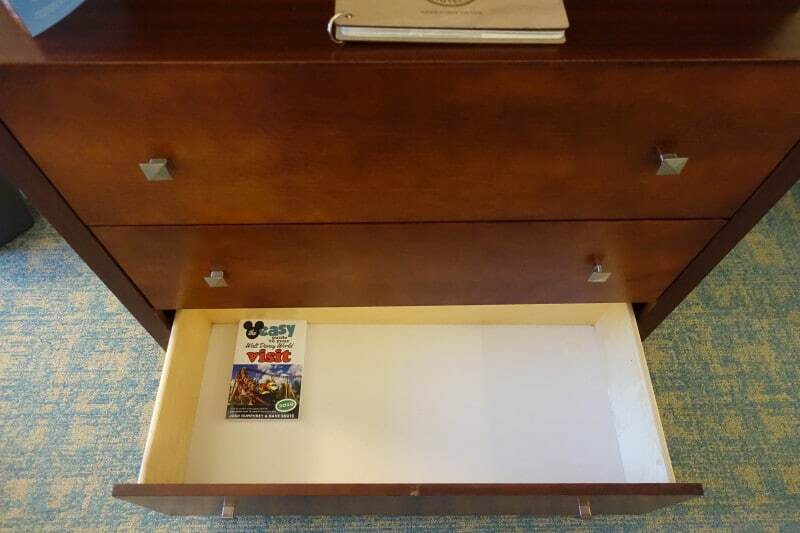 Between the beds is this bedside table with a drawer and a storage cubby below. 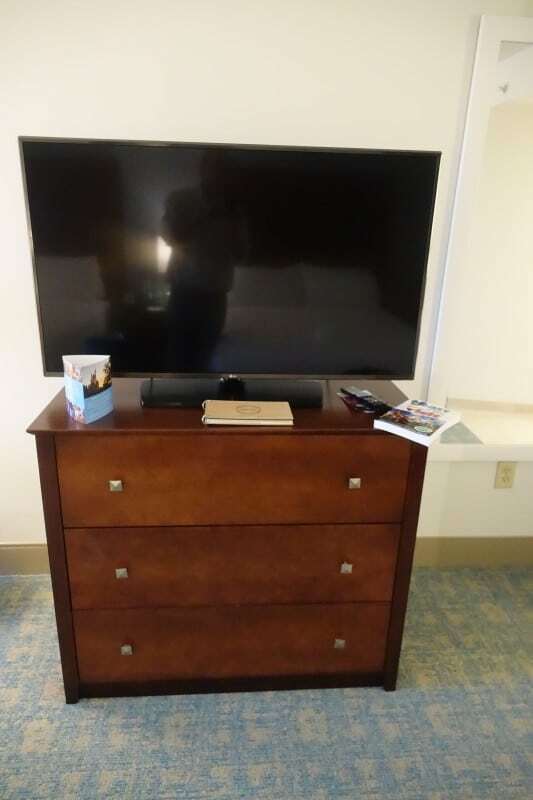 The other side of the room has a dresser with a TV above and a desk. The TV side of the room from the back. I got the TV as having a 48 inch diagonal. 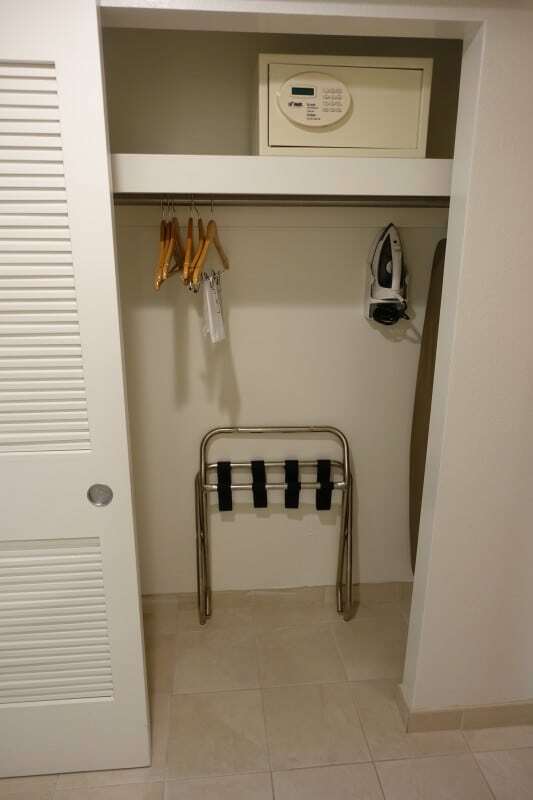 The three large dresser drawers are likely enough storage for the four people this room will hold. Deeper in the room you will find this small desk. It includes a small drawer. Beyond it is the entrance to the balcony. Pool view rooms–especially those that are lower in this six story building–are close to the pool deck and its noise, but I did not find this an issue during my cool December stay here, when few people were in the pool. If you’ve stayed in one of these rooms when the pool has been quite active, let me know how noisy it was for you using the comment form below! 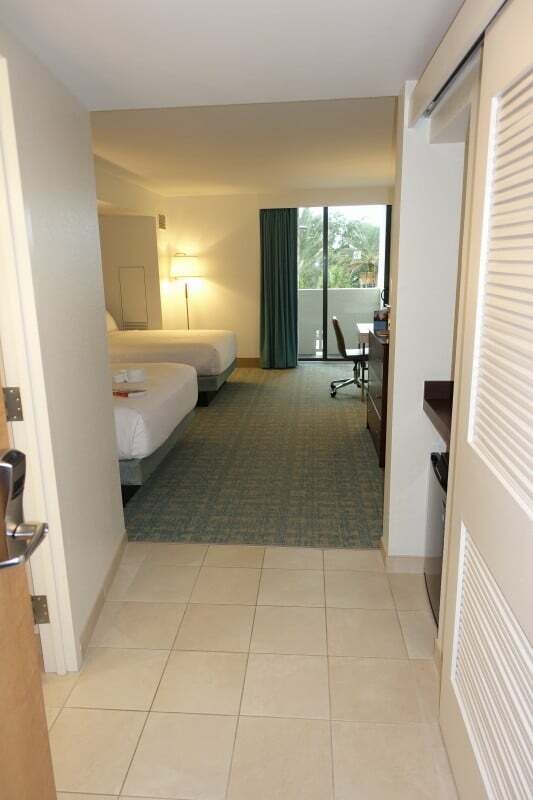 I got this Holiday Inn Orlando pool view room as being about 360 square feet, slightly larger than a tower room here and comparable to the smallest of Disney’s deluxe hotels, but with a larger bed/living area and a smaller bath area than those. 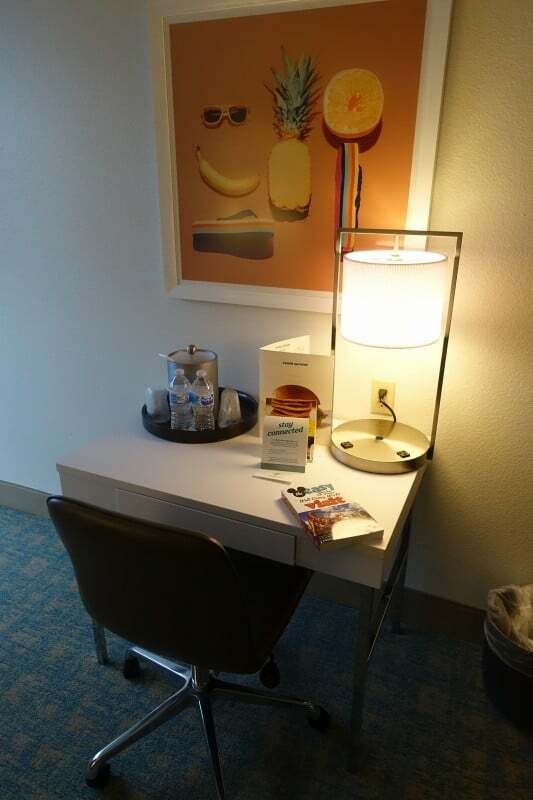 The microwave and balcony are nice touches, and rare among the Disney Springs Resort Area hotels, but the absence of a divided bath and of an easy chair or other seating beyond the desk chair (although I suppose you could drag in the balcony chairs) makes it less family friendly than other possible choices.